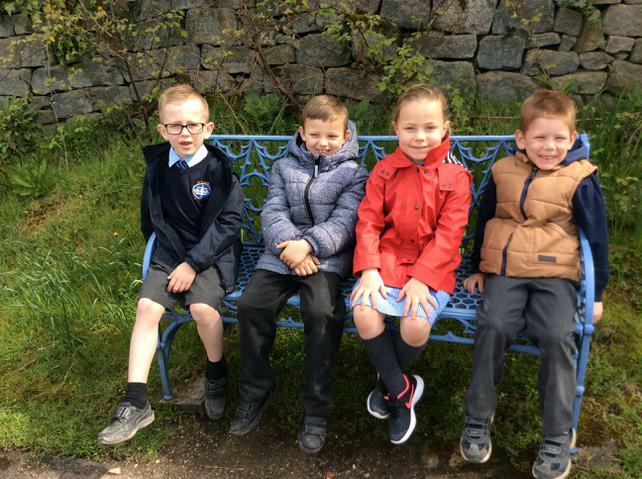 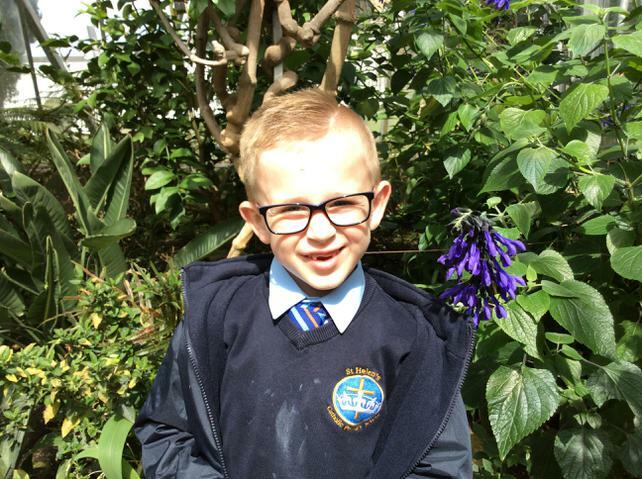 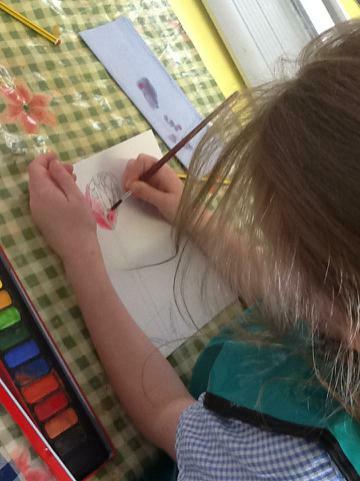 This Week, Year 2s in our class worked very hard to complete their SATs tests and Year 1 children have also shown they are very motivated in their learning, in particular, in our RWI learning time. 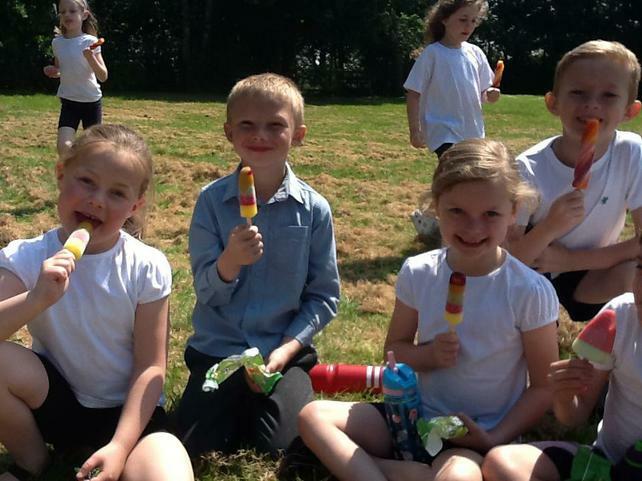 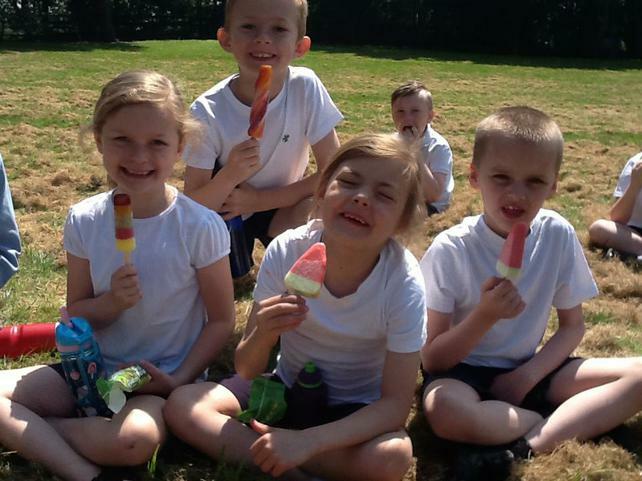 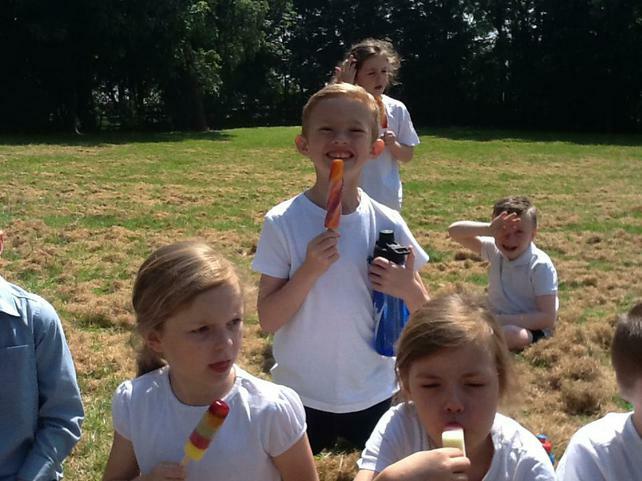 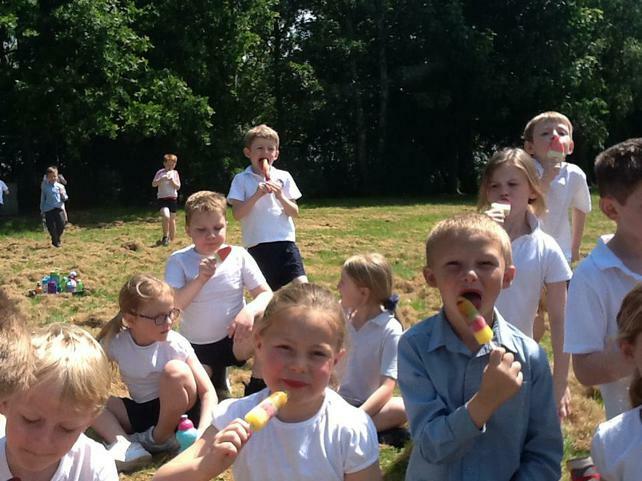 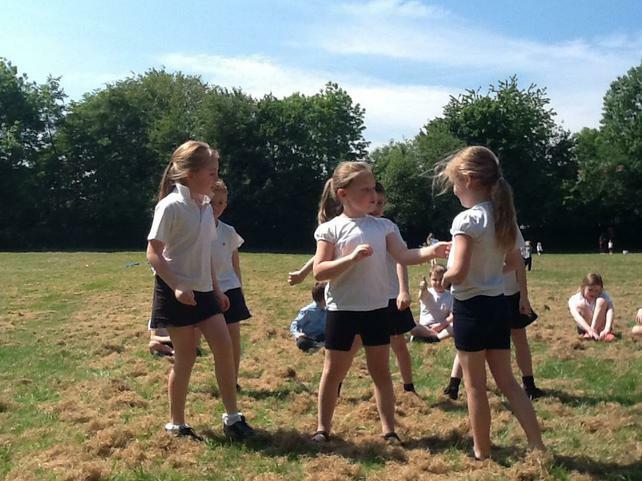 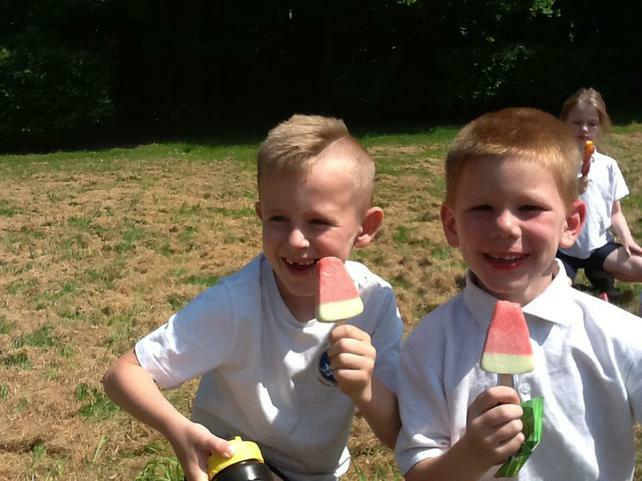 Hence, this Thursday we had some lovely time on the field with ice lollies and we auditions for our school's very own St Helen's has got talent! 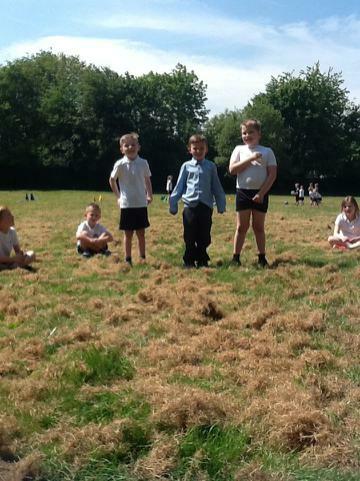 The children practiced routines and acts and then performed for us and we voted for our favourite acts. 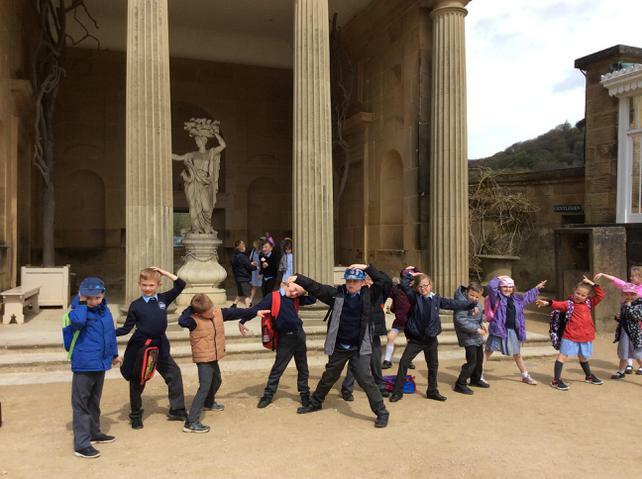 Both a dancing and, Elvis song and dance act, got through to our school competition and we are so excited to see them again on the day! 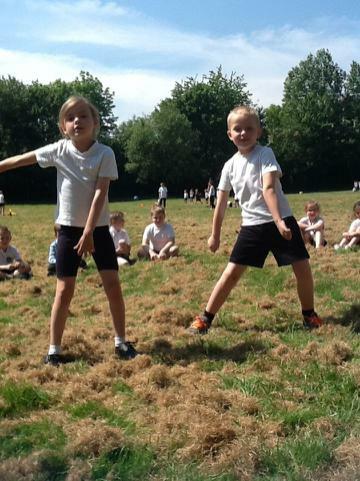 After our auditions, Class 2 practiced for our school sports day which will be on the first Thursday after the school holiday! 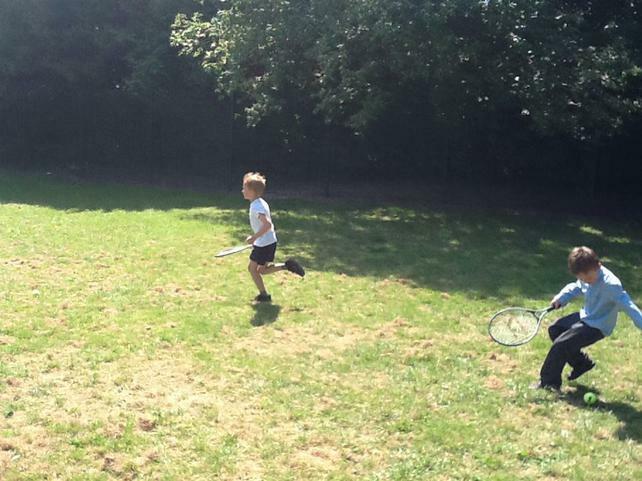 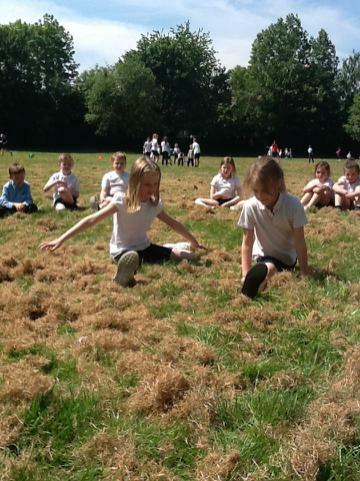 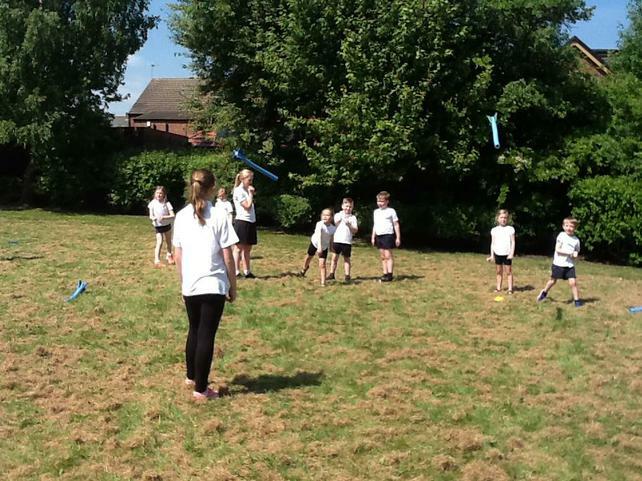 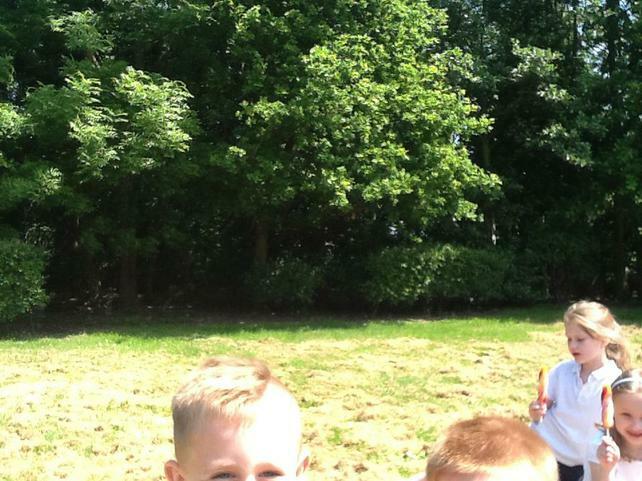 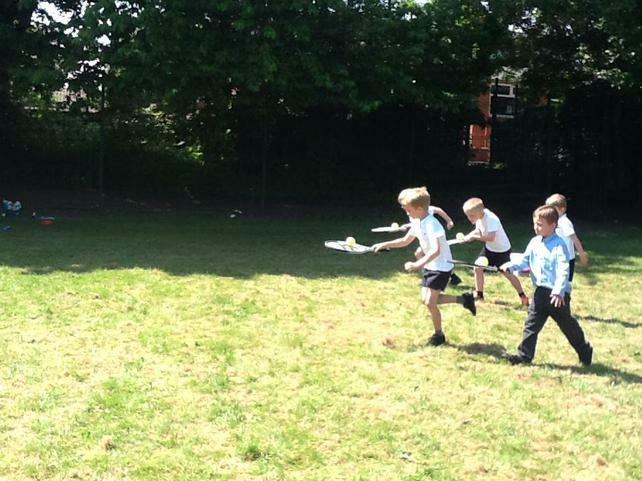 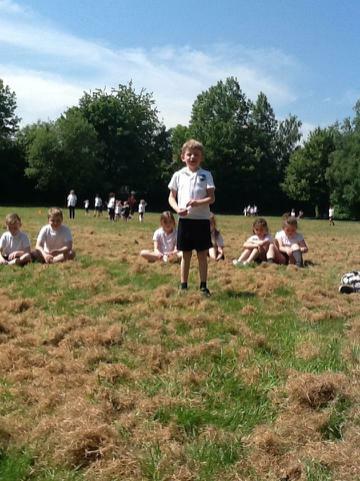 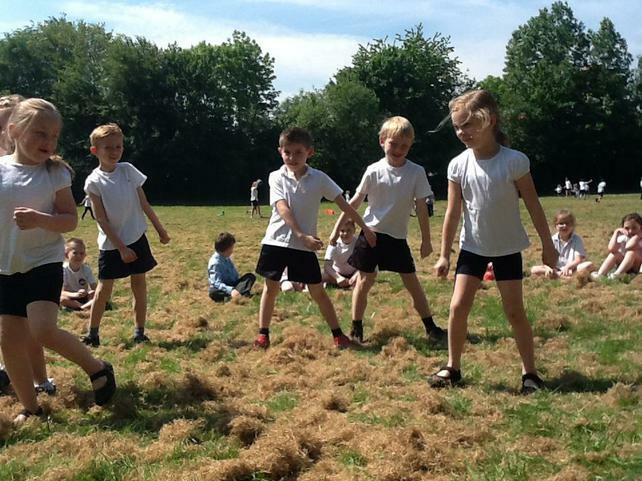 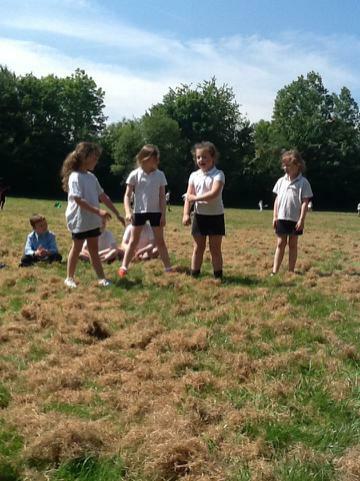 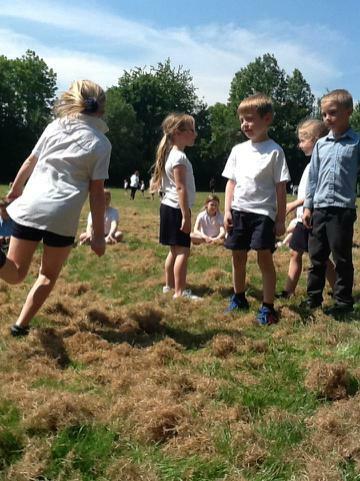 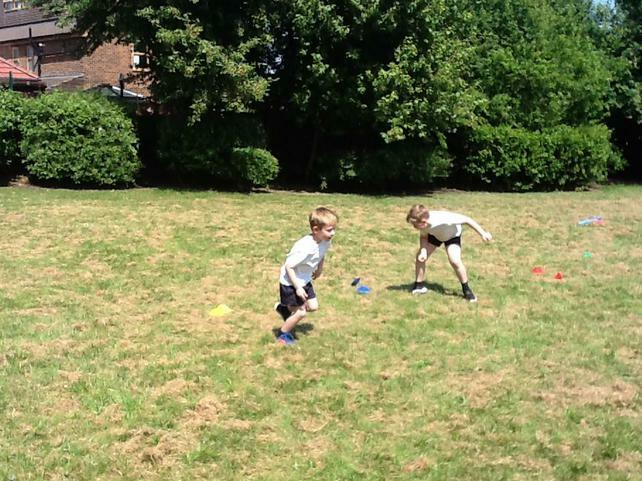 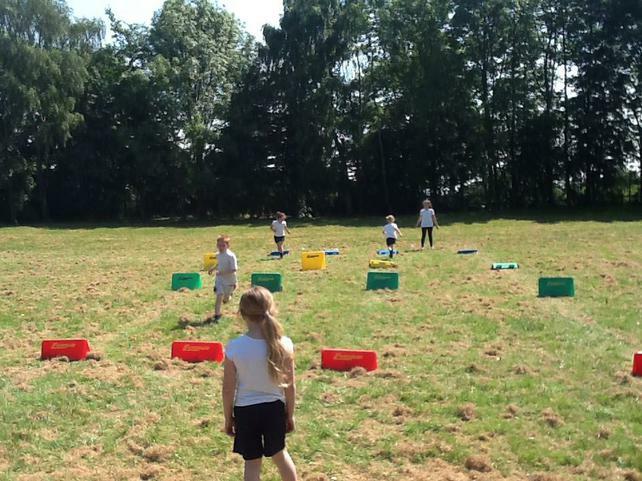 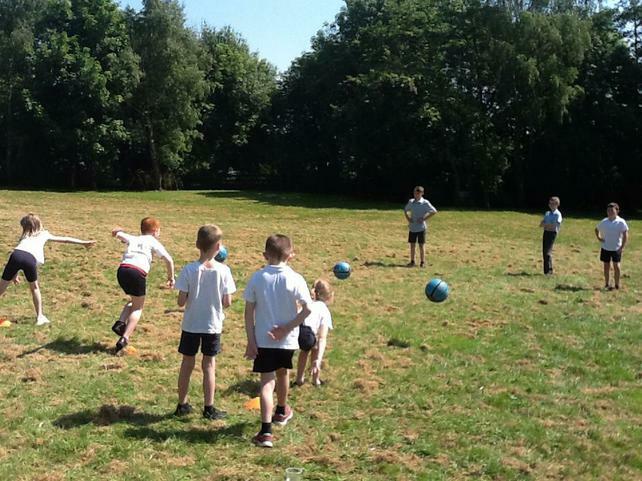 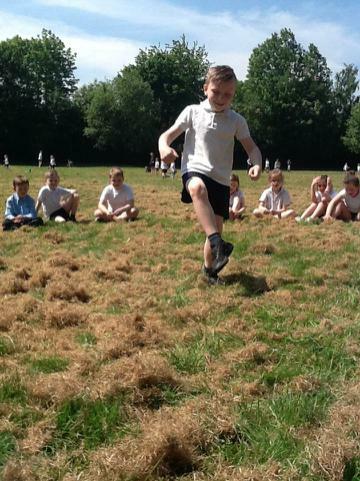 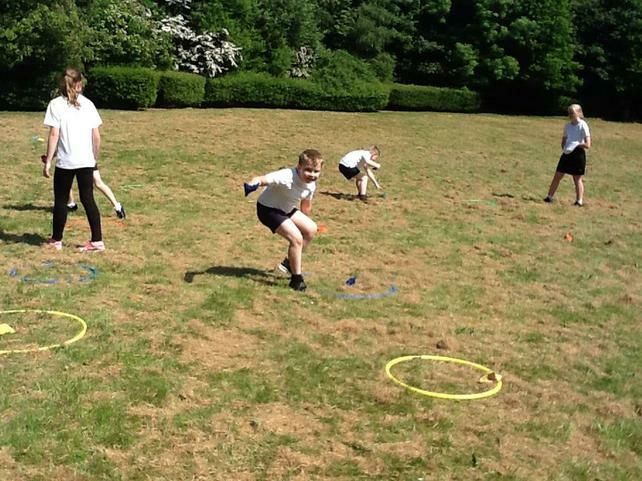 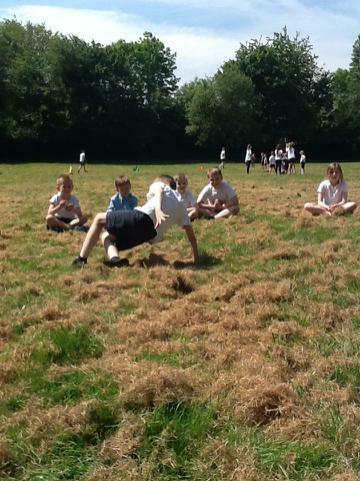 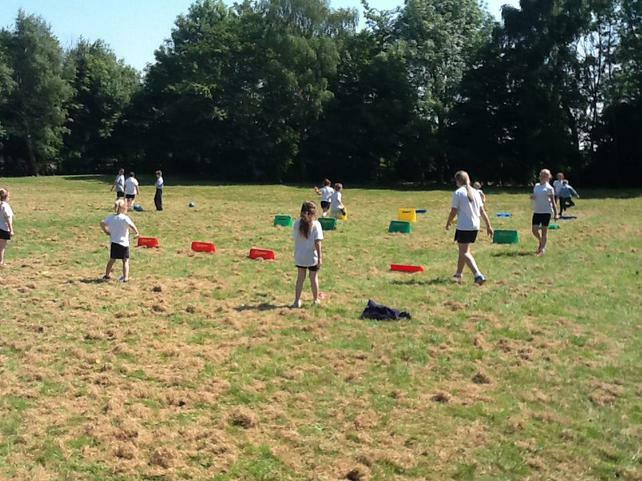 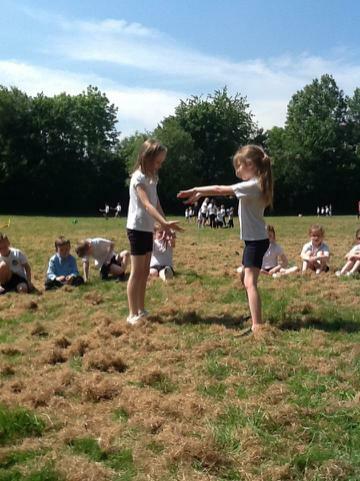 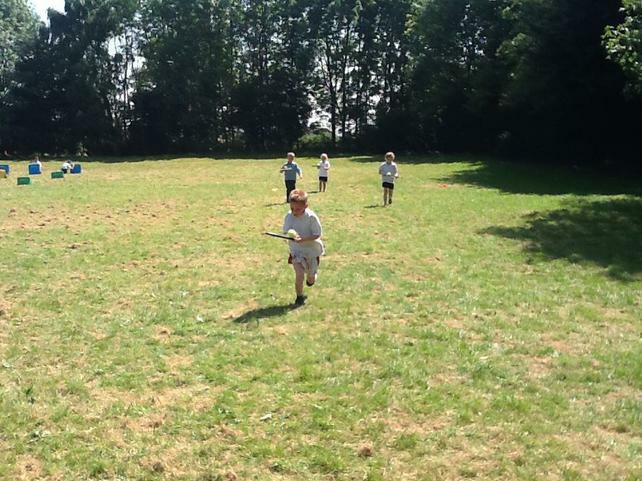 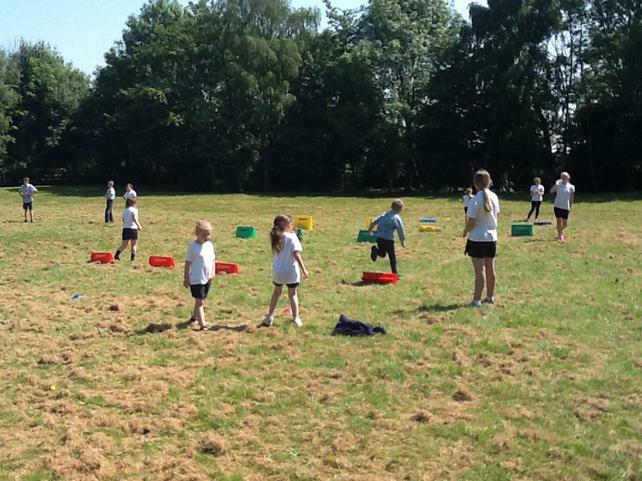 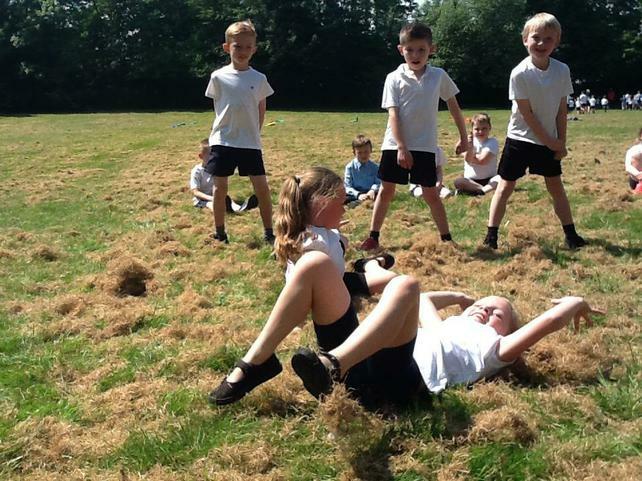 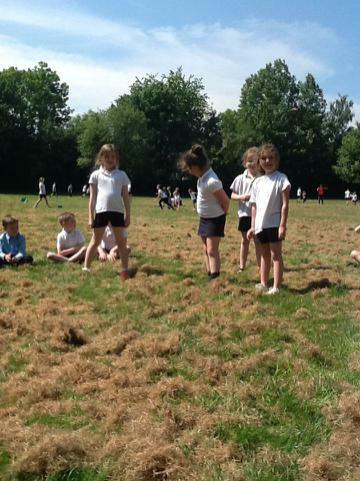 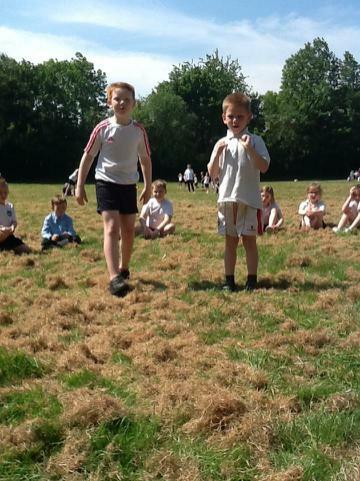 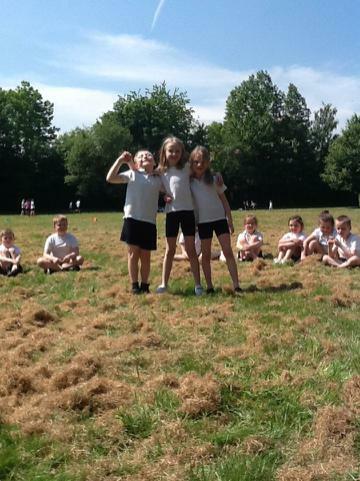 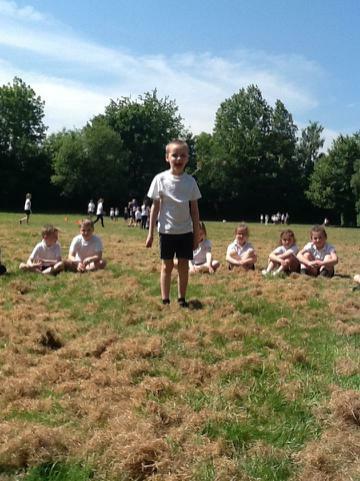 They did fantastically and have shown lots of determination and ability for our sports day. 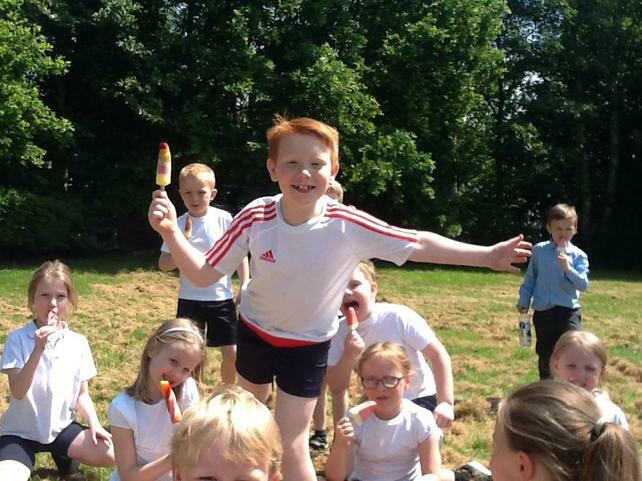 Thank you for working so hard this term everyone in Class 2, have a well deserved break and I will look forward to seeing you after our holiday! 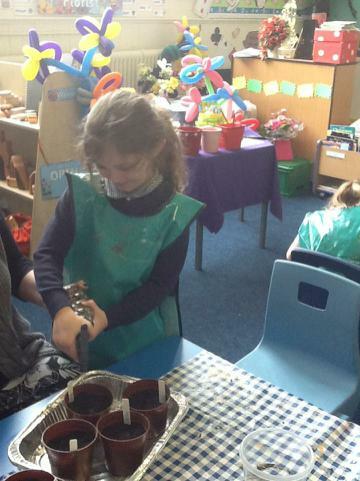 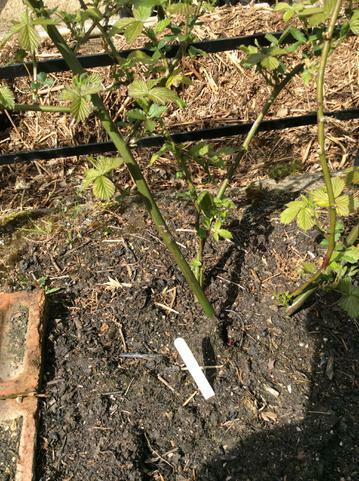 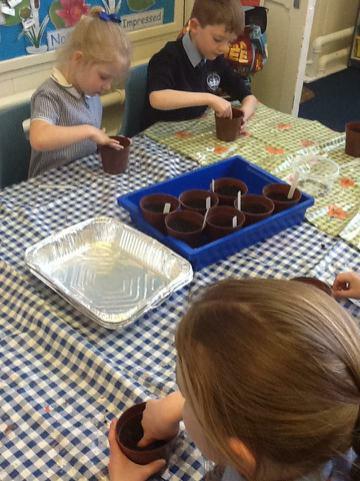 This week, we have taken great care when looking after our class sunflowers. 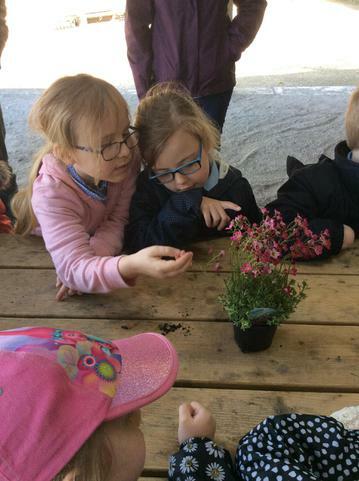 Our class water monitors have remembered to care for our flowers everyday. 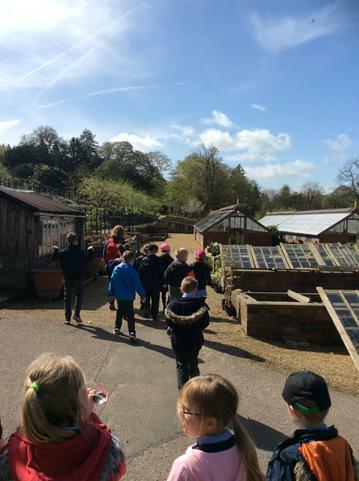 Take a look at the growth we have seen so far! 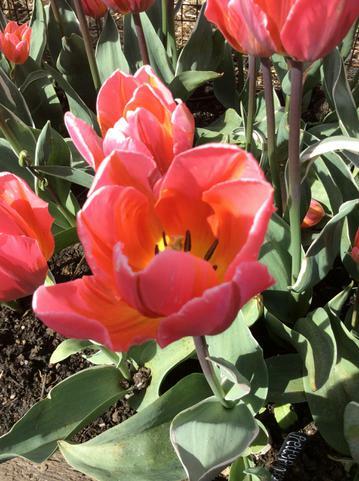 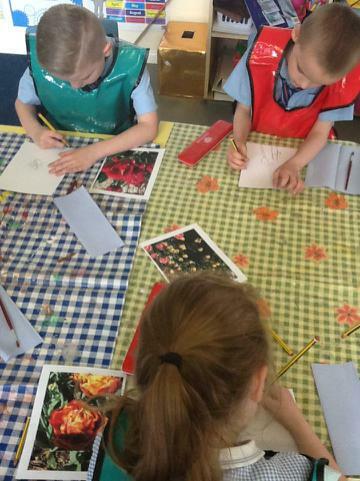 This week, Class 2 have used photographs from our school trip to Chatsworth Gardens to create our own images of different types of tulips with watercolour paints. 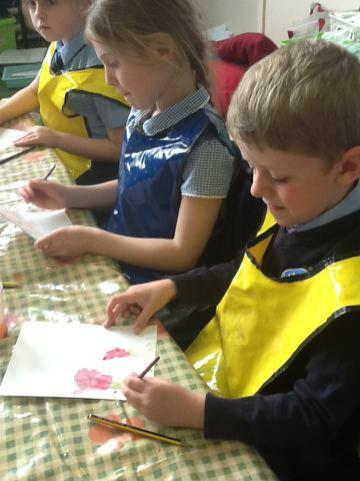 Everyone worked so hard and concentrated in order to use our paint sensibly, to mix some beautiful colours and to create fantastic paintings. 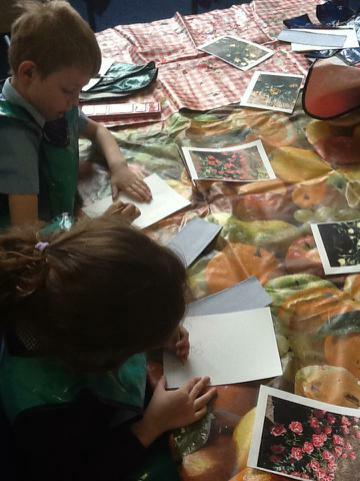 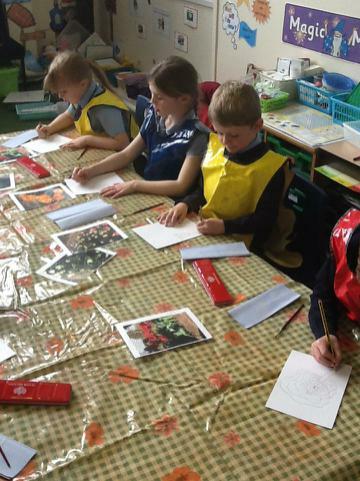 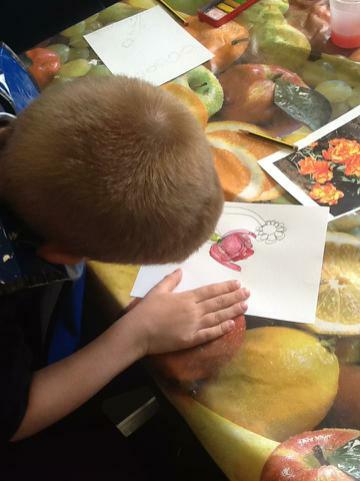 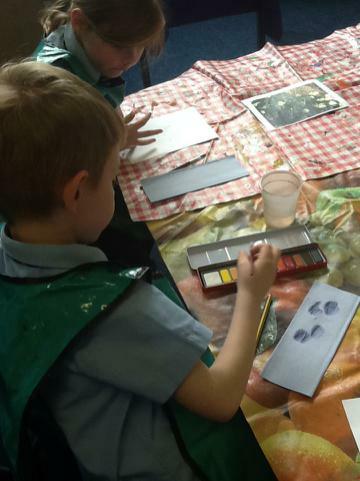 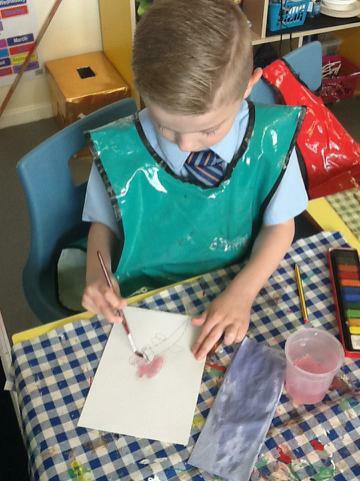 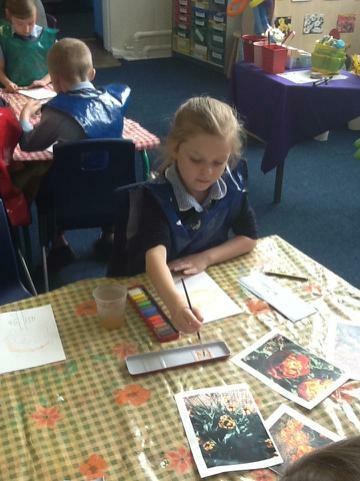 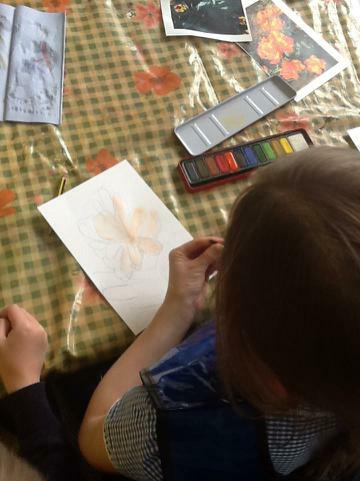 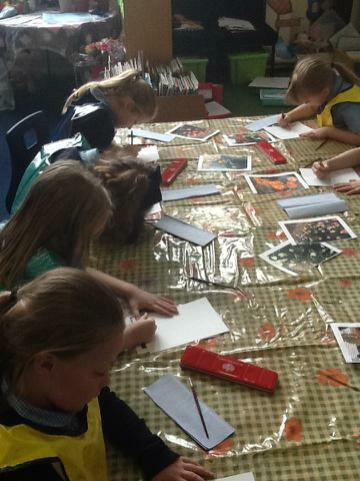 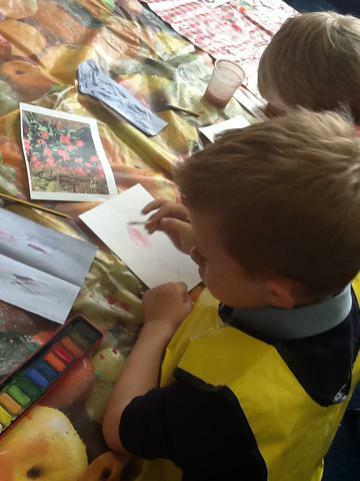 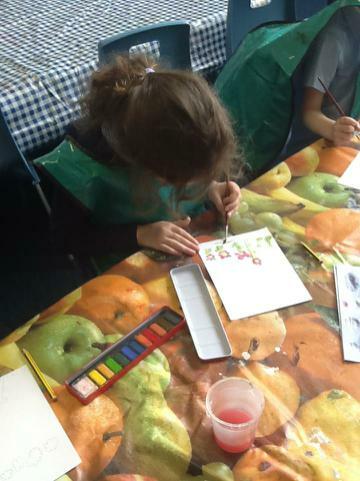 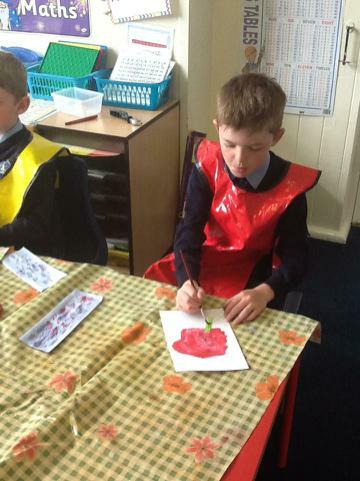 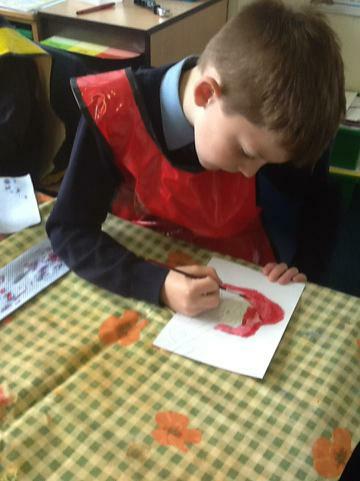 Take a glimpse at the photographs of members of Class 2 when they were creating their masterpieces! 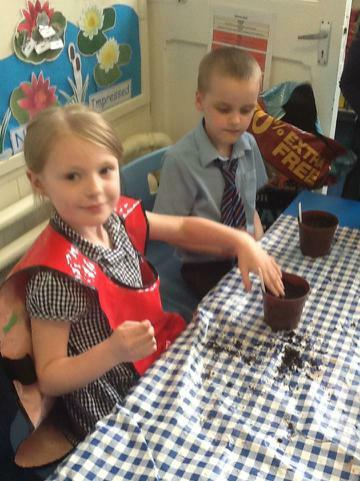 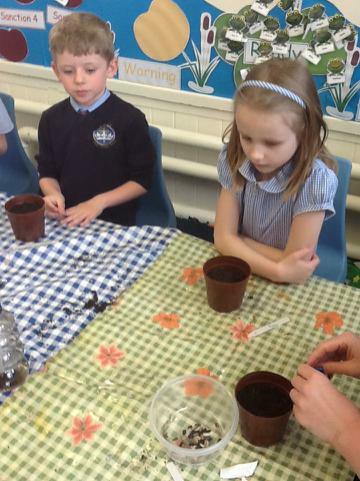 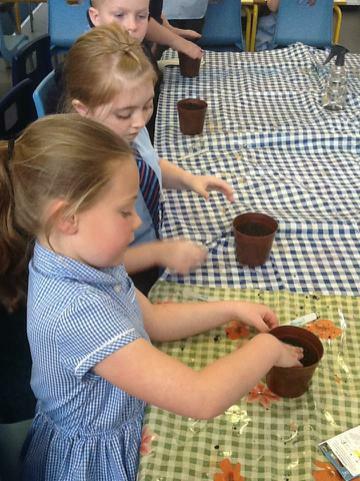 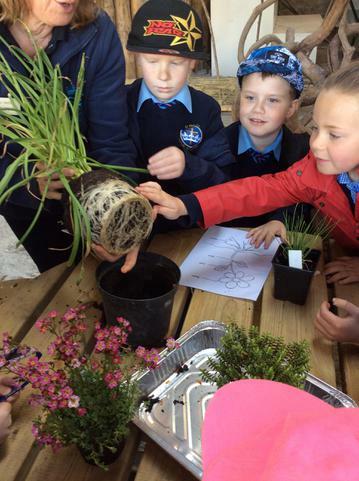 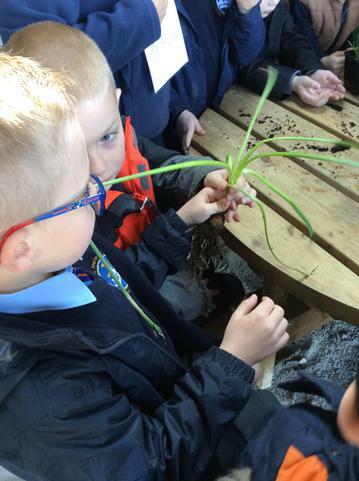 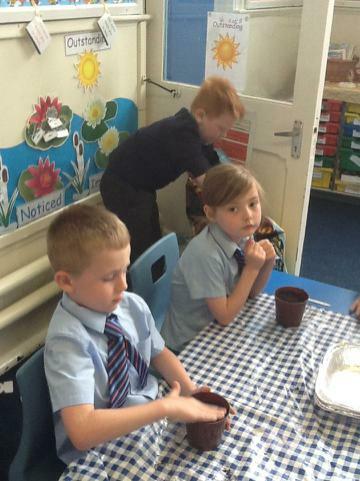 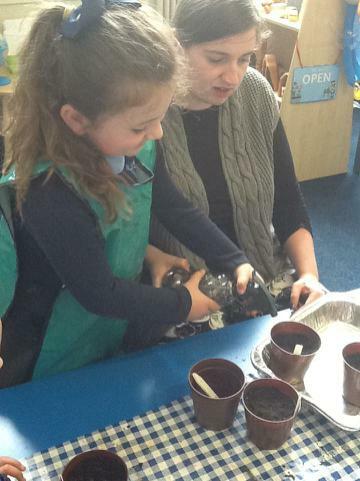 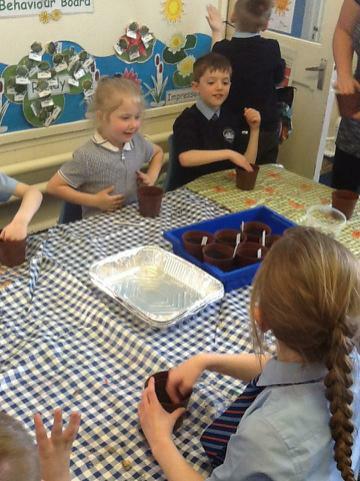 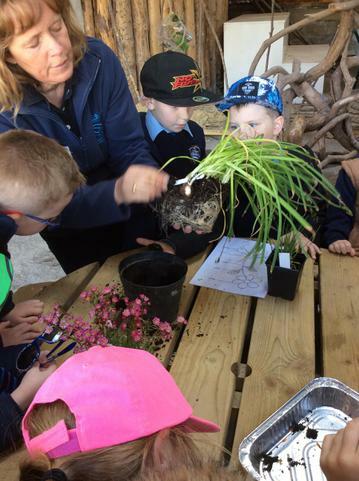 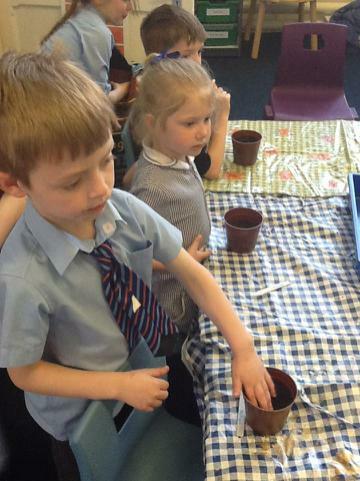 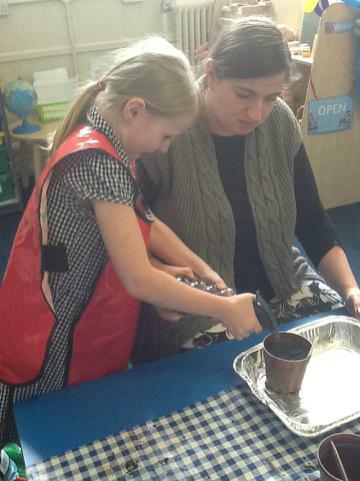 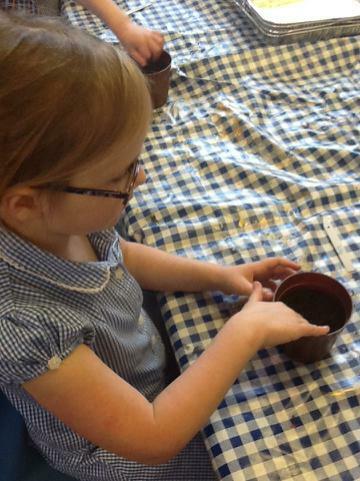 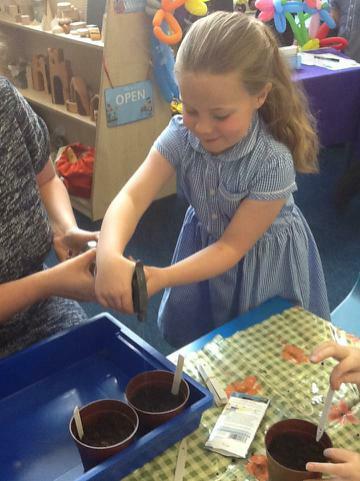 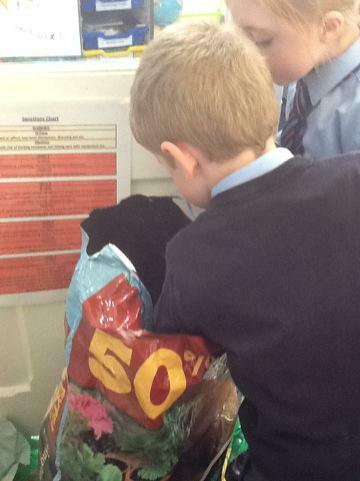 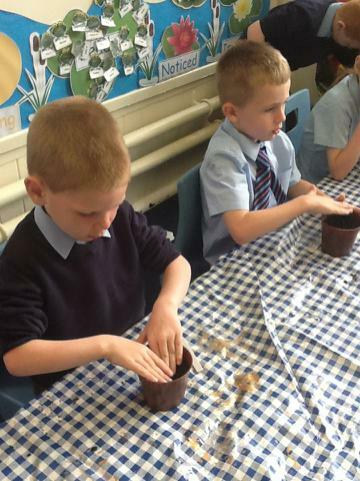 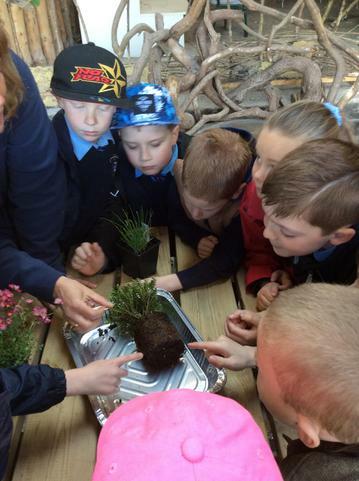 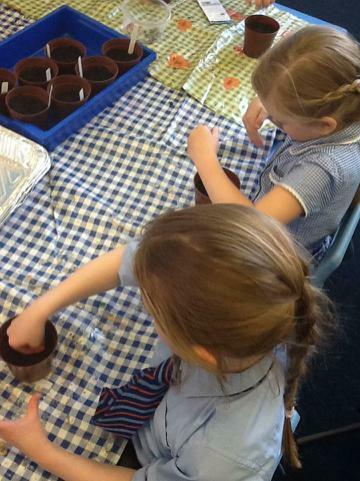 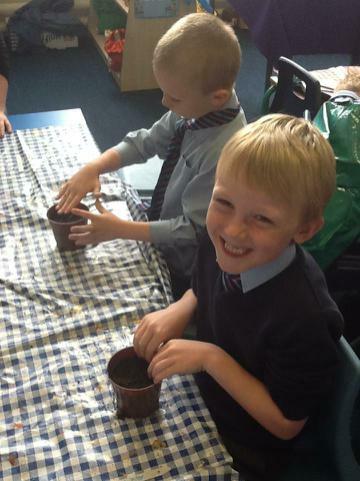 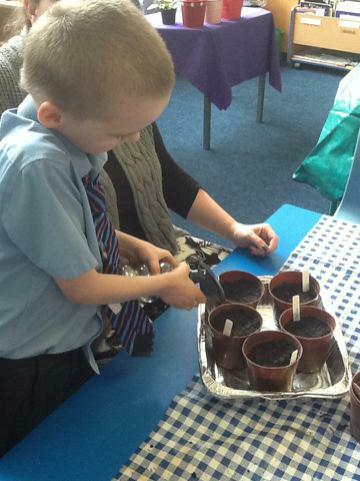 This week, Class 2 also had the opportunity to learnt about how you can grow Sunflowers. 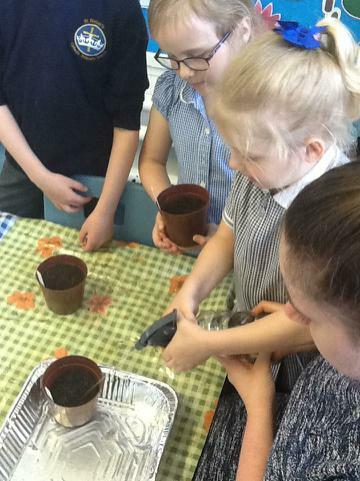 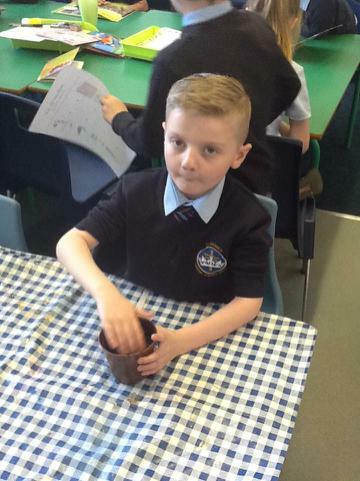 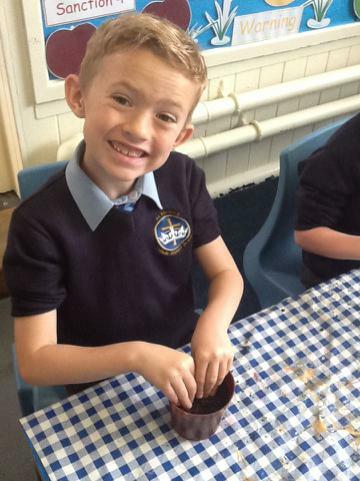 We read a story as a class and gained lots of information about Sunflowers and then, everyone planted their own Sunflower seed in a small pot with soil and watered them. 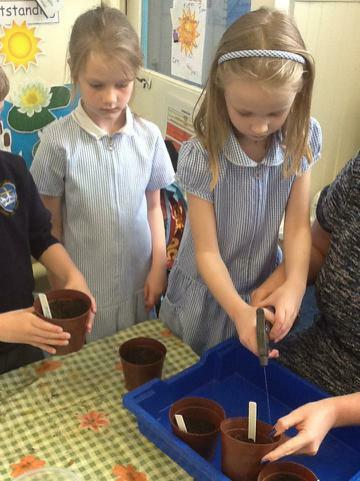 We have set two members of our class the important job of watering our Sunflowers so, hopefully we will see growth soon! 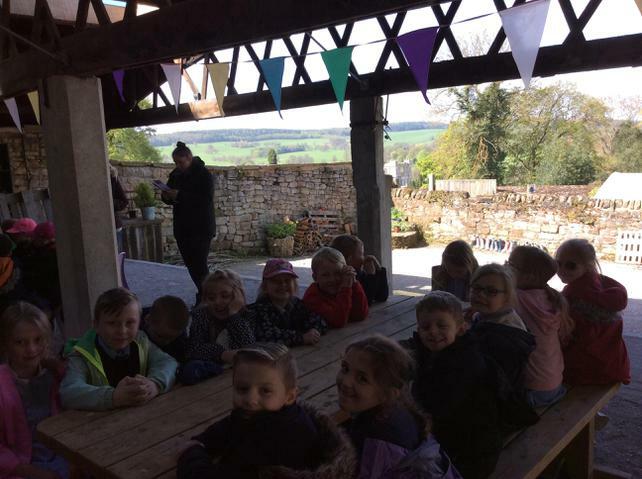 We'll keep you updated! 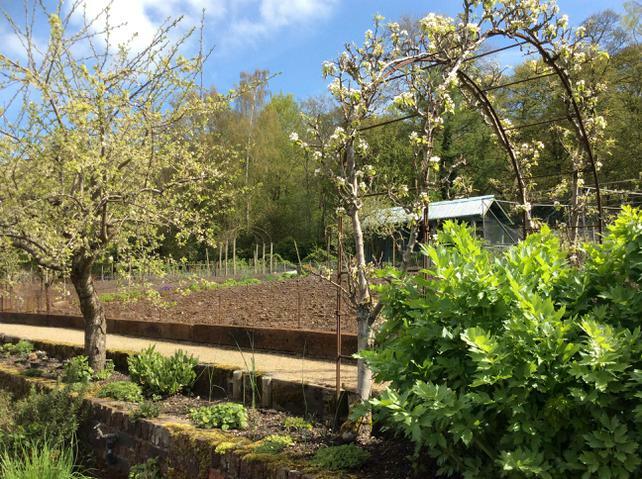 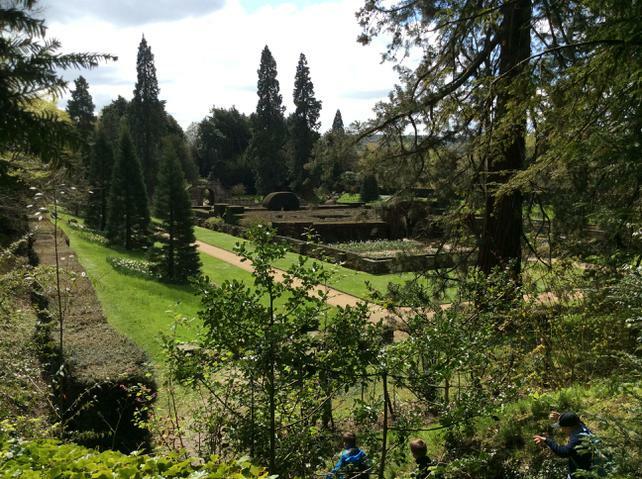 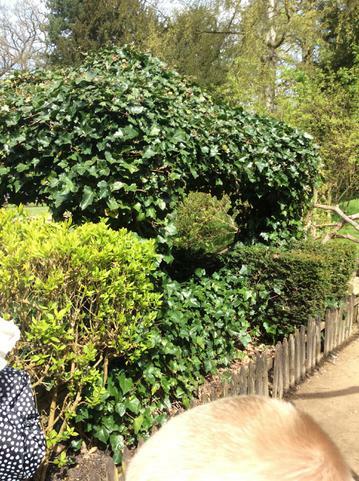 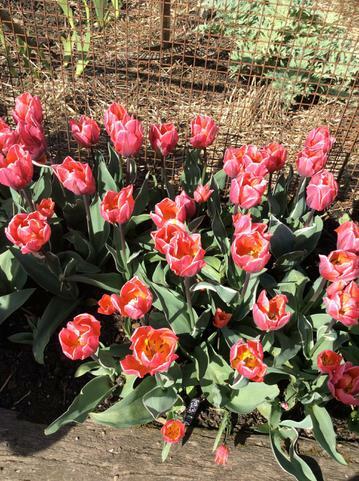 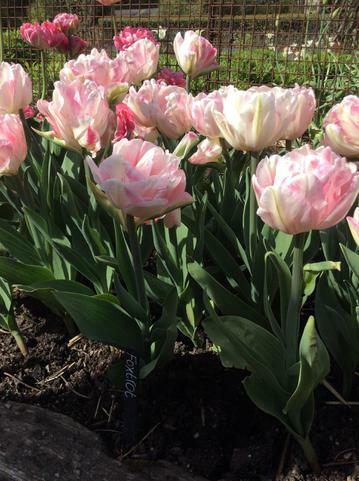 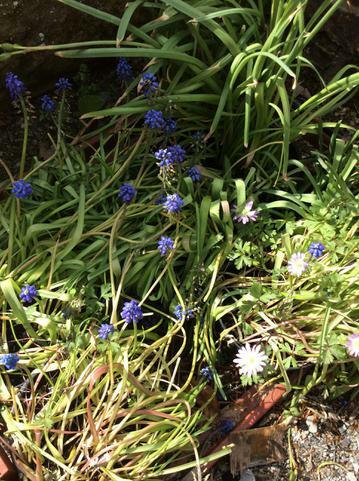 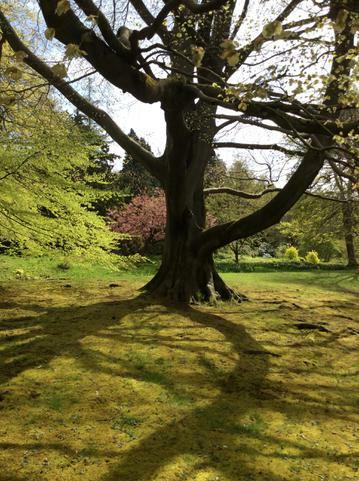 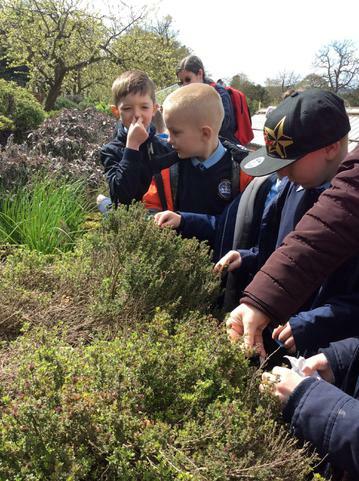 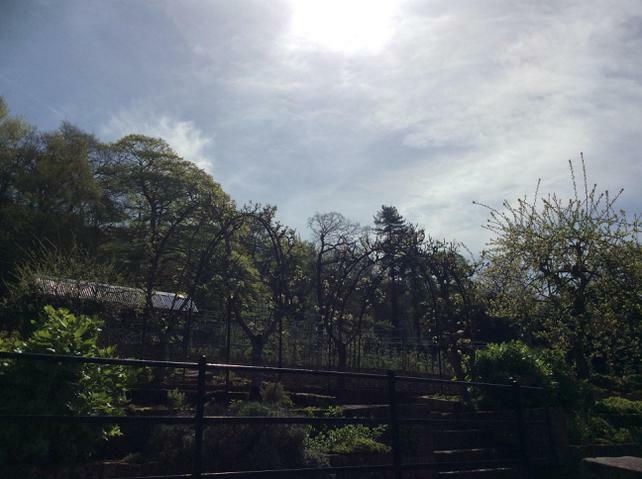 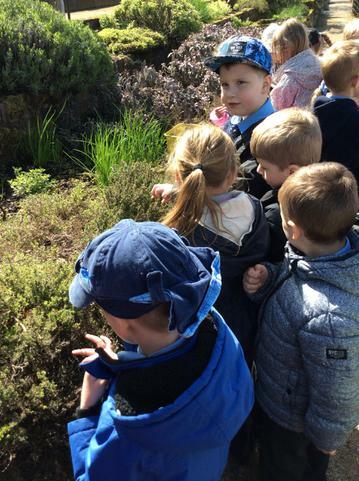 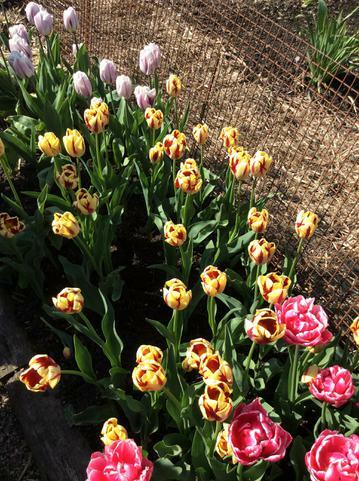 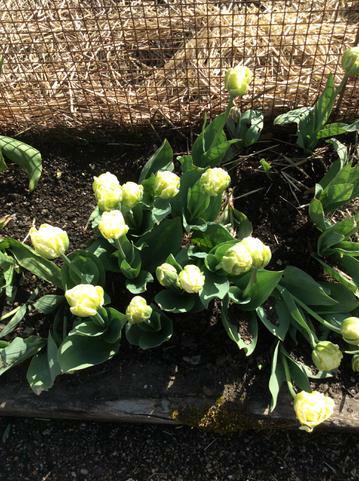 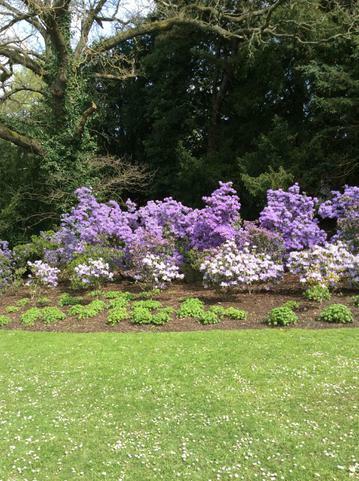 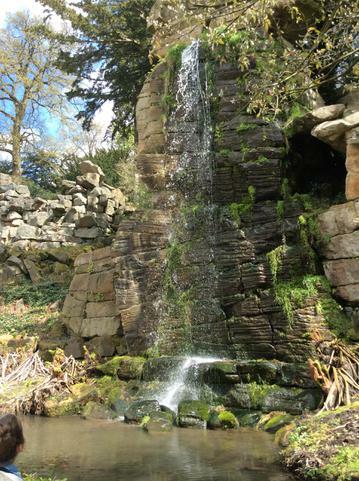 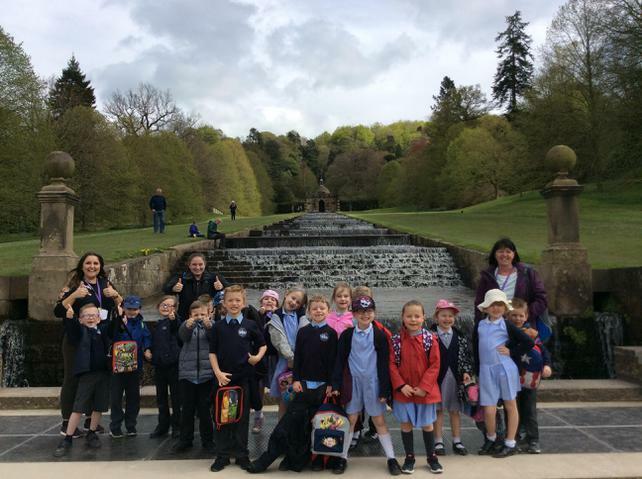 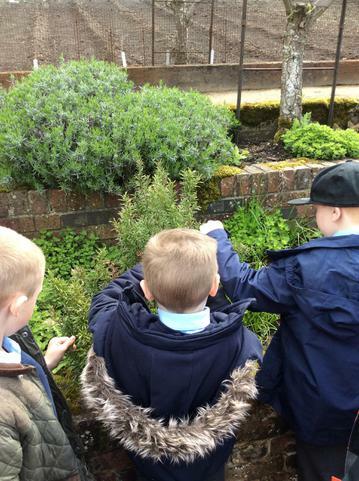 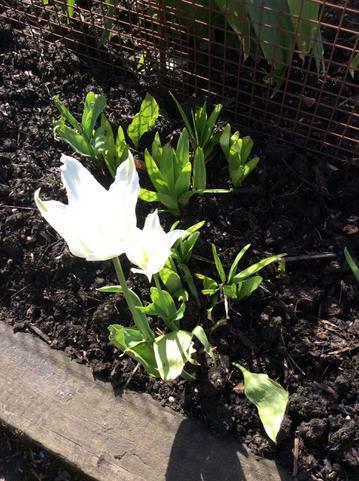 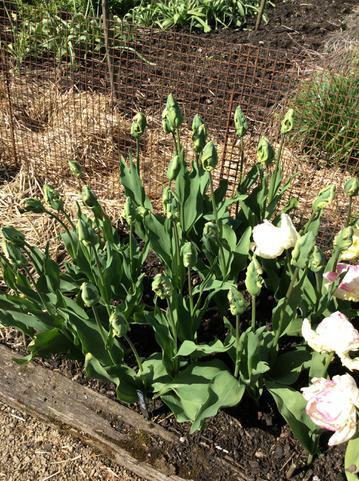 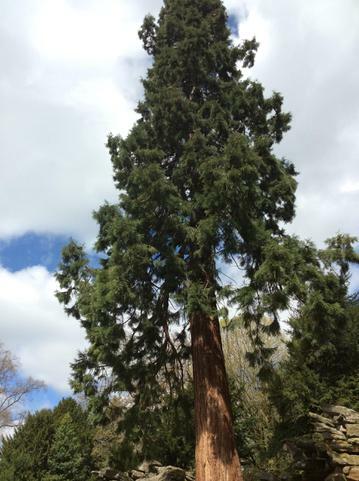 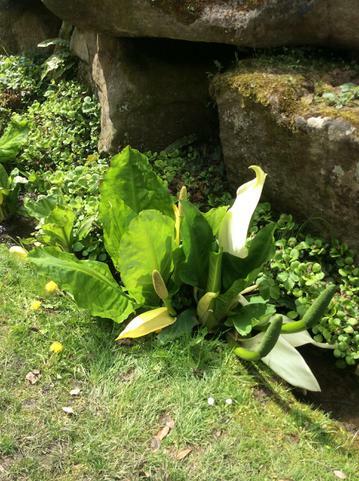 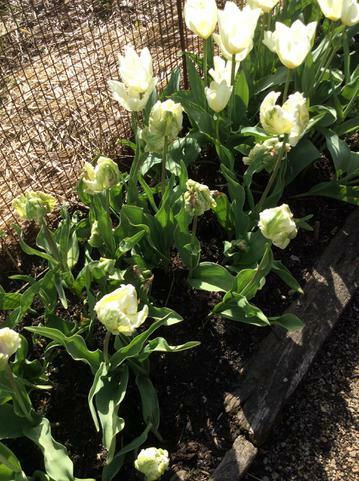 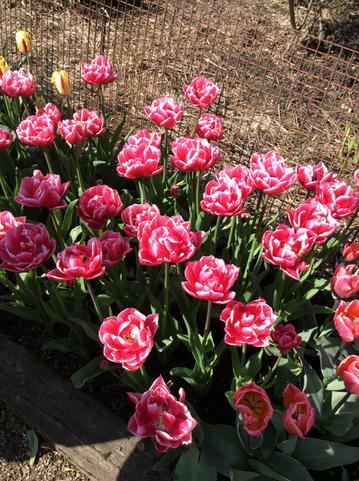 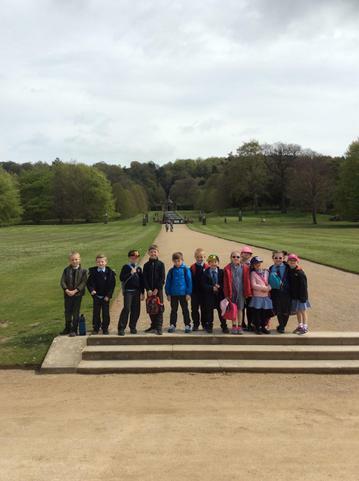 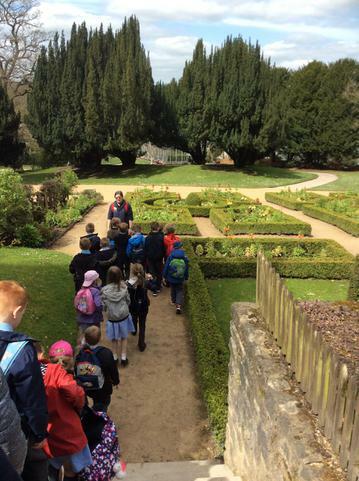 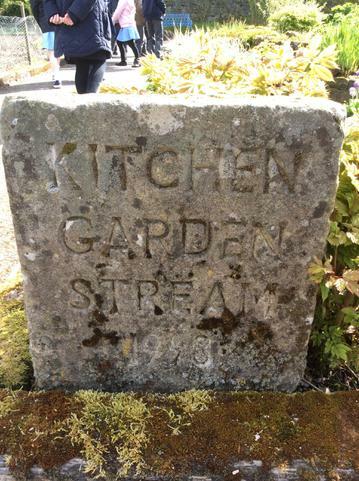 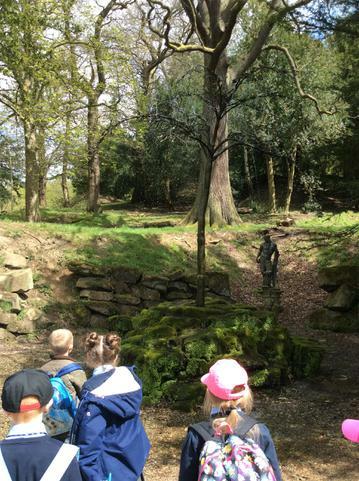 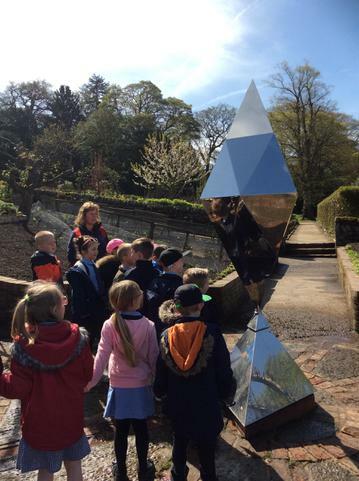 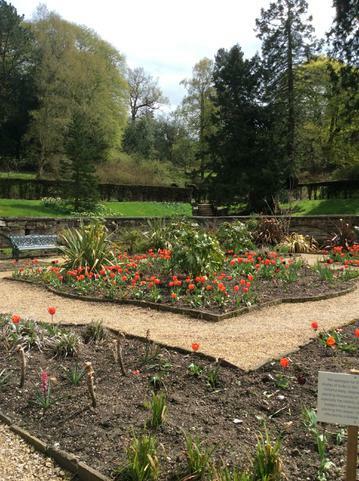 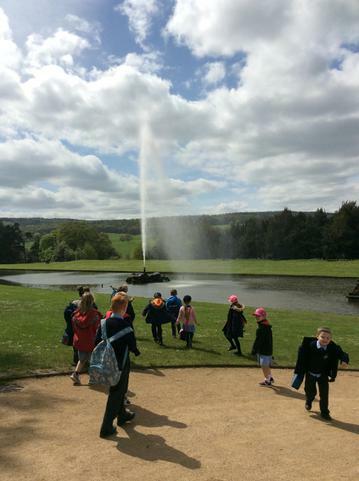 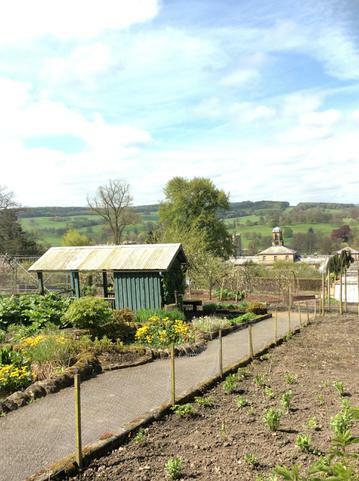 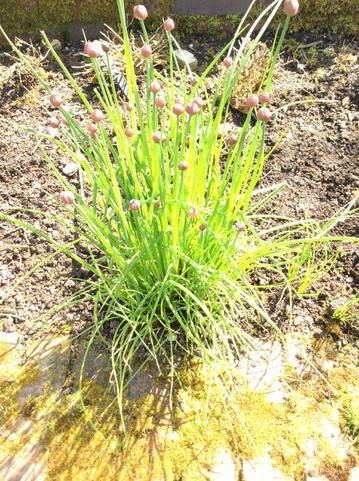 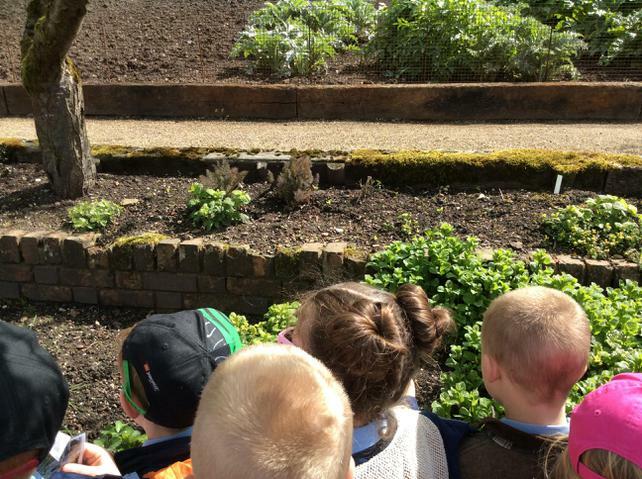 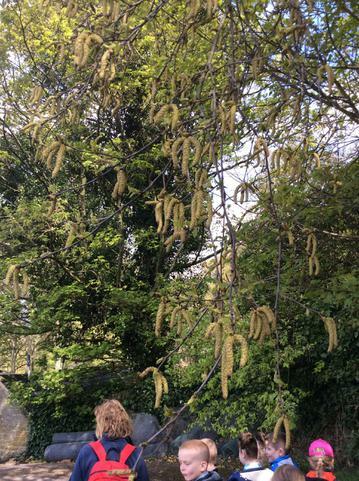 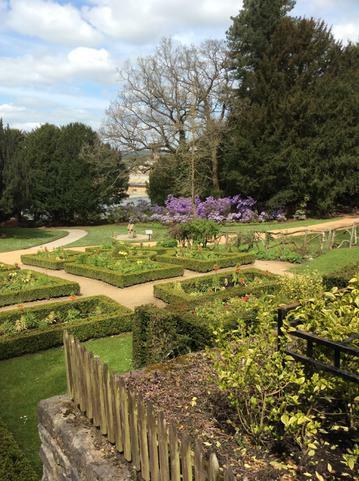 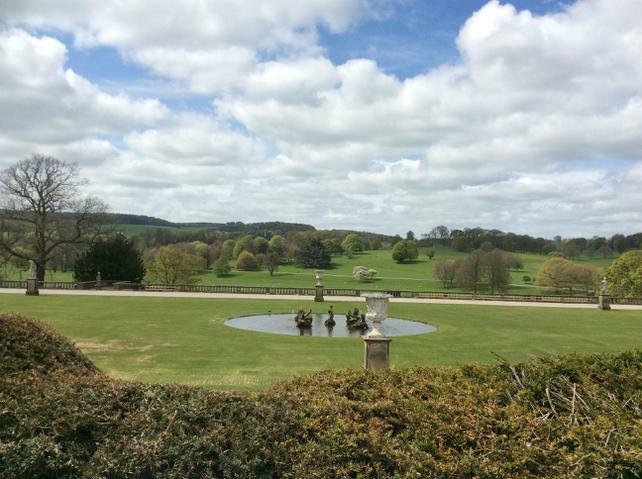 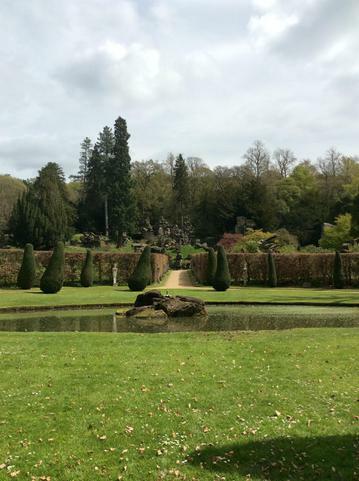 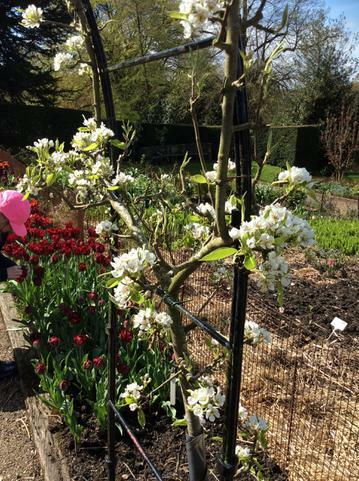 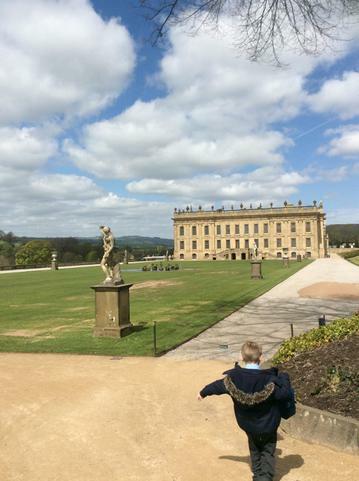 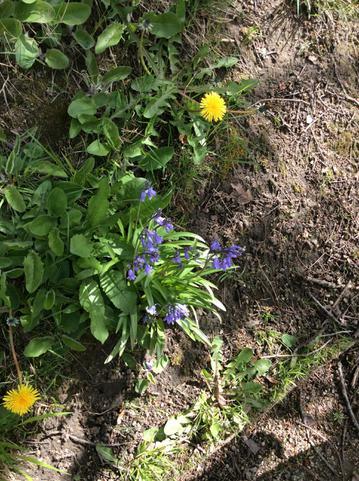 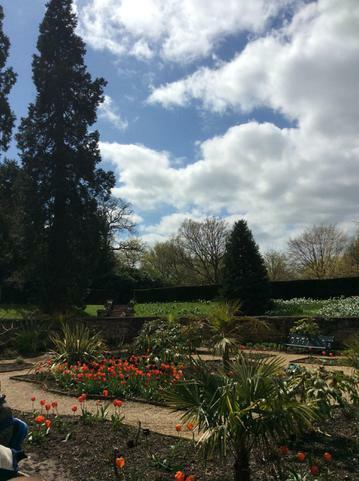 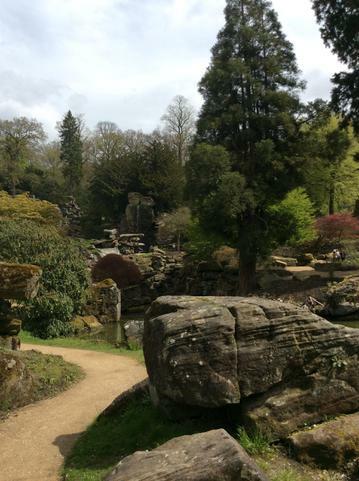 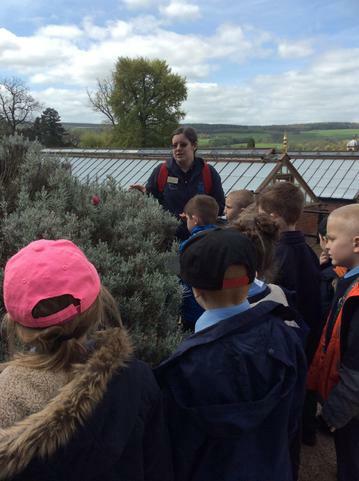 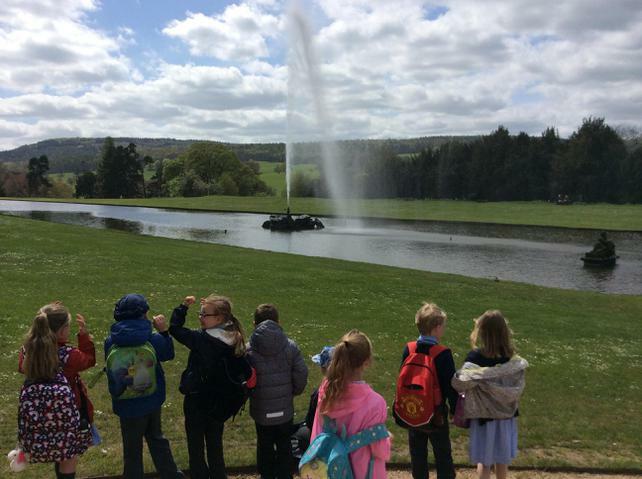 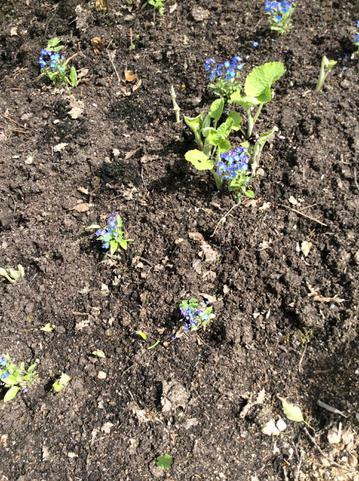 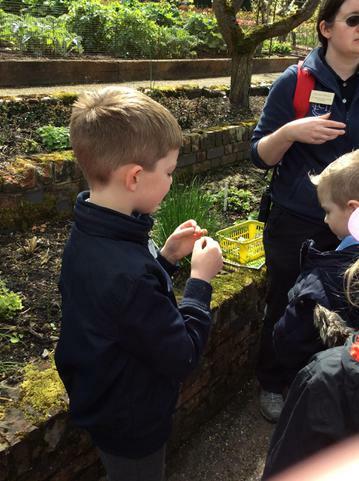 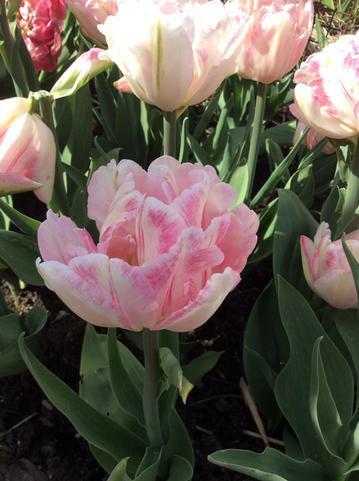 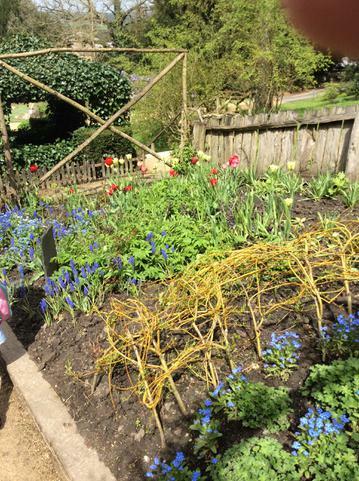 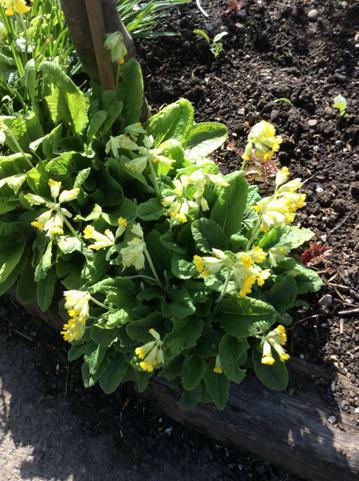 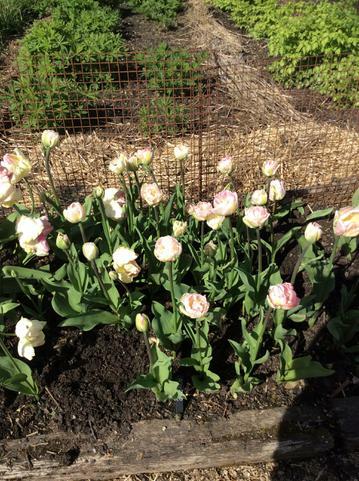 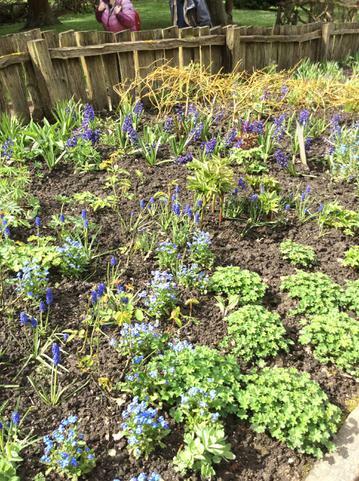 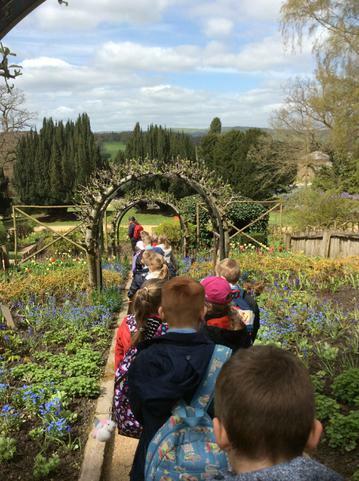 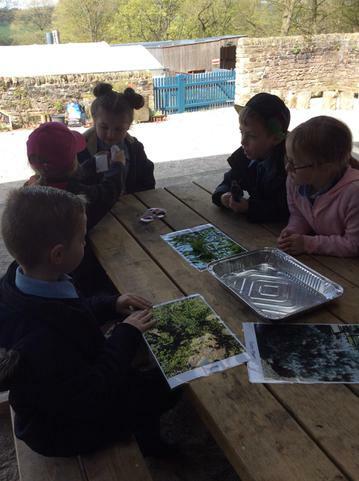 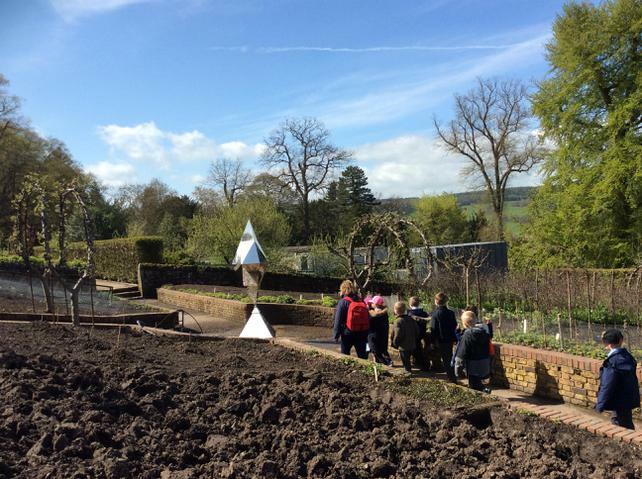 On Thursday 3rd May 2018 Class 2 travelled to Chatsworth Gardens to start our Scented Garden topic off and beautifully began our topic. 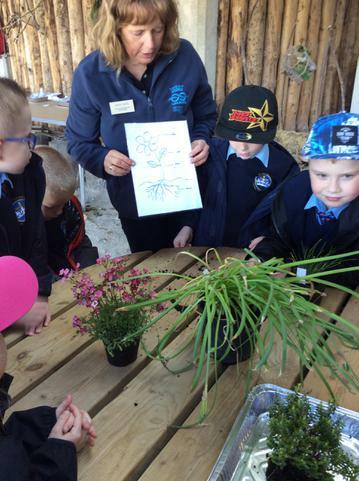 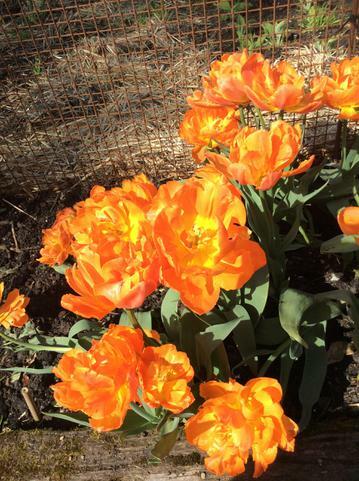 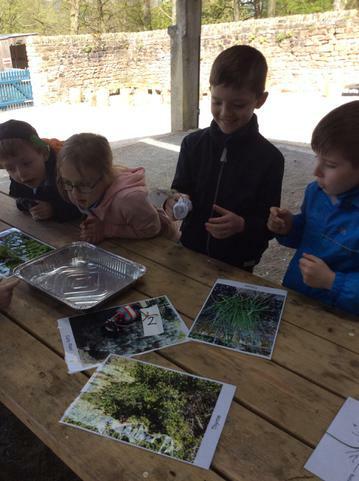 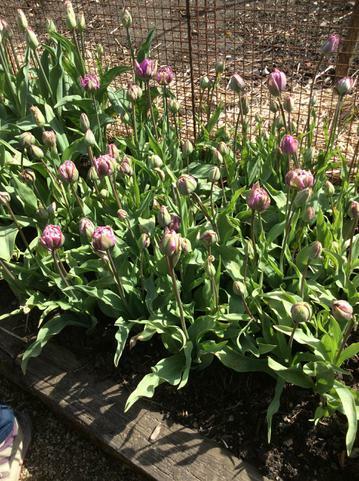 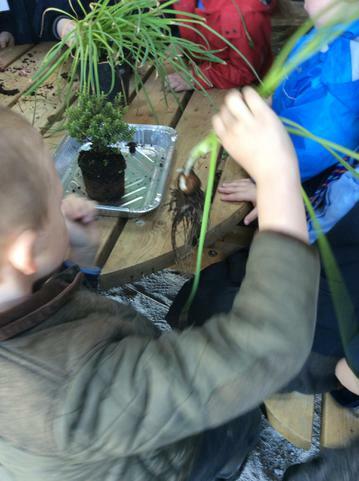 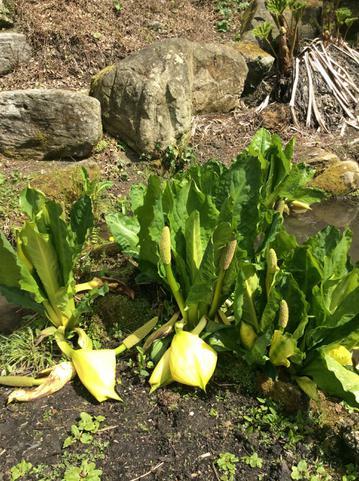 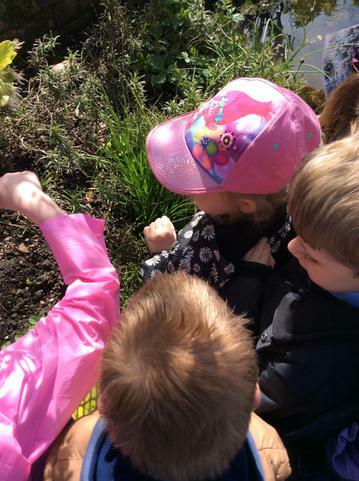 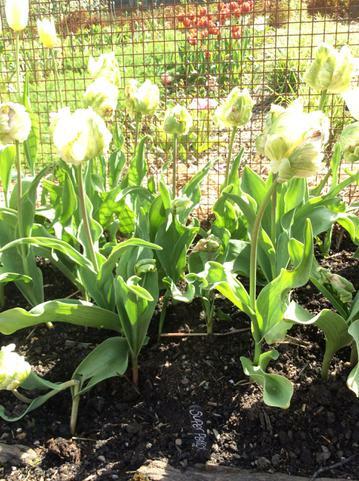 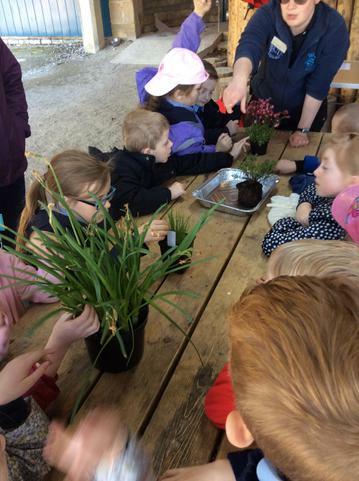 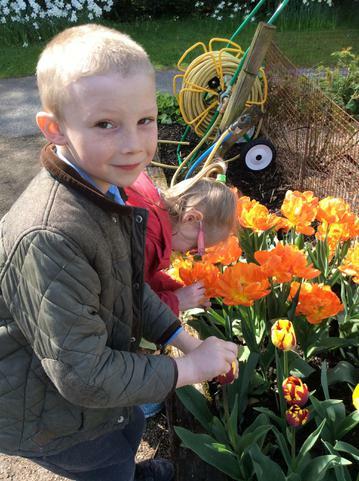 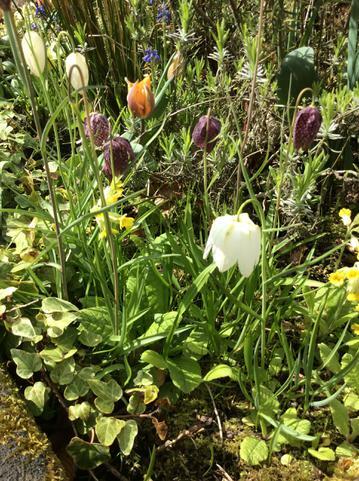 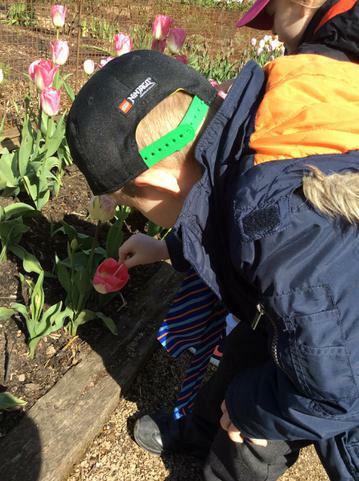 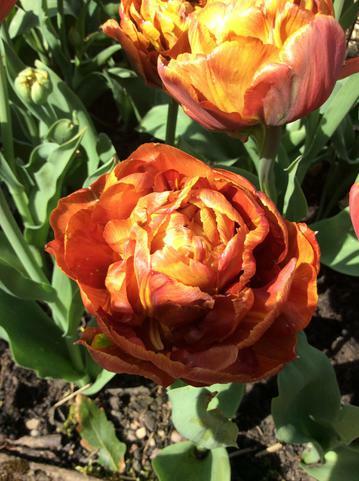 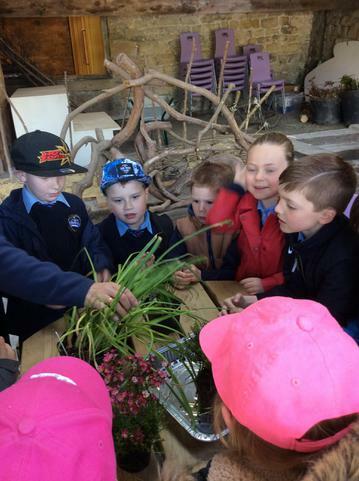 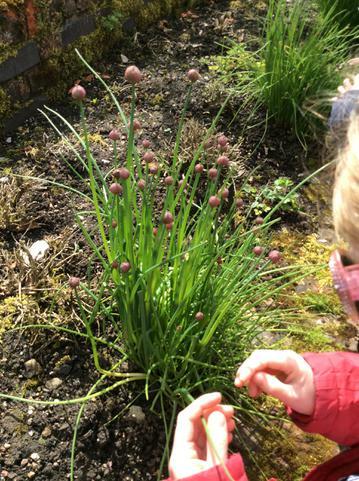 The children were so well behaved and engaged in our own bespoke Scented Garden workshop at the centre when we learnt about pollination of flowers and acted as bees, spreading pollen from one tulip to another in the beautiful gardens. 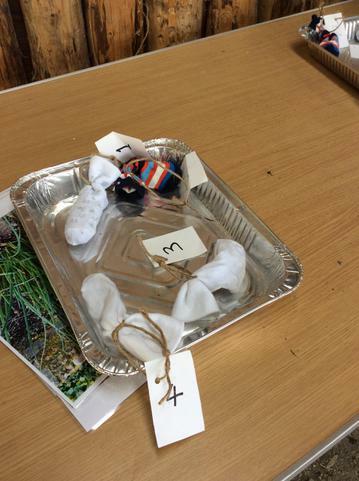 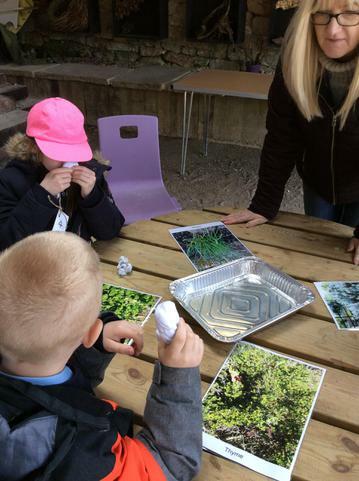 We then explored herbs and tested our sense of smell by matching images of herbs to the smelly sock with that herb inside. 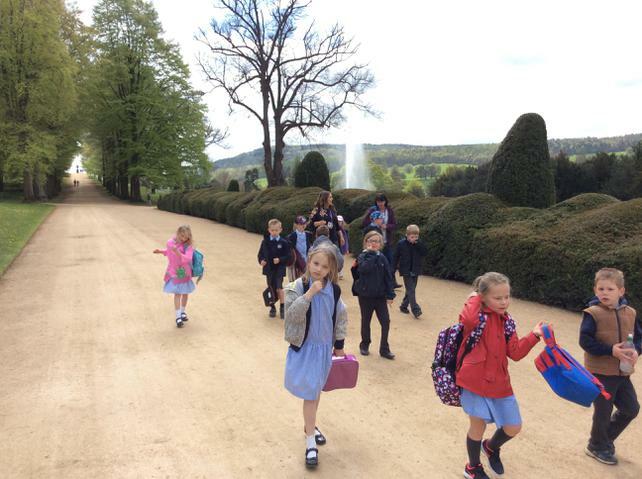 After our excellent workshop, we had our lunch as a picnic within Chatsworth's lovely gardens and we explored the grounds in our groups. 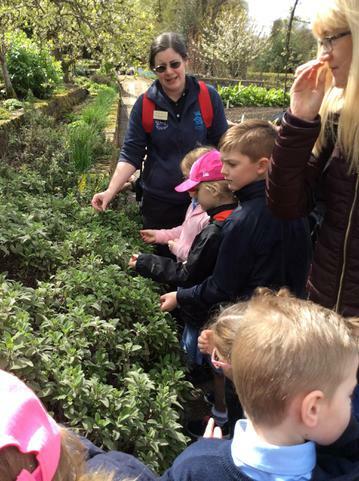 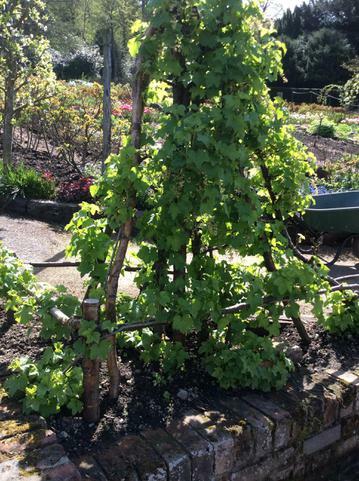 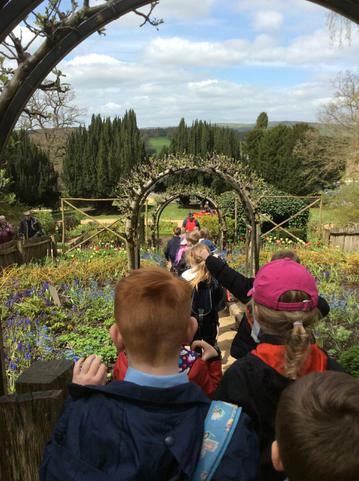 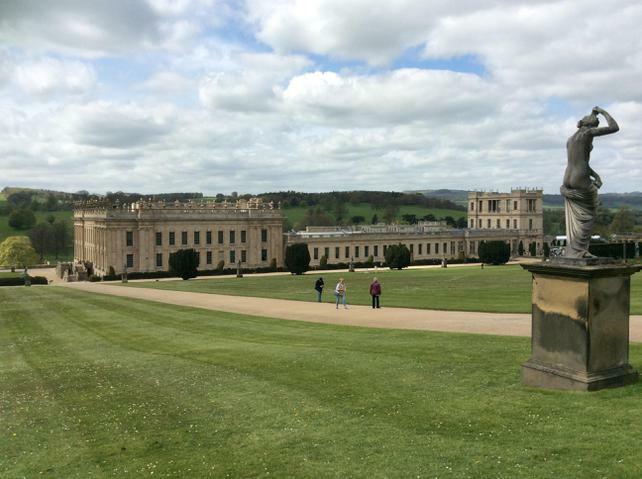 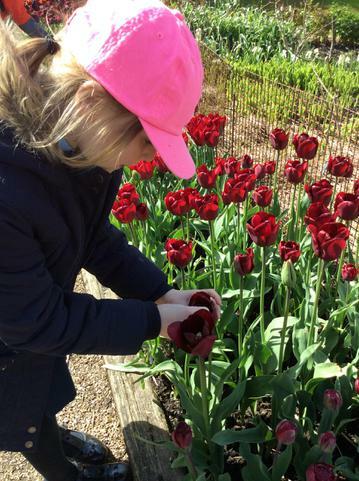 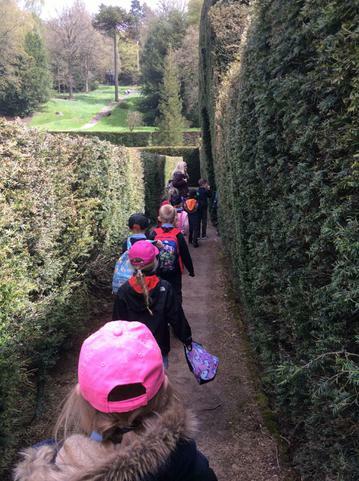 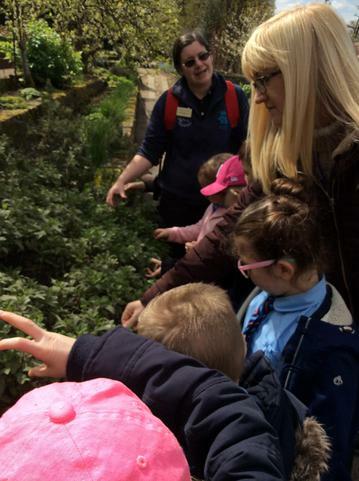 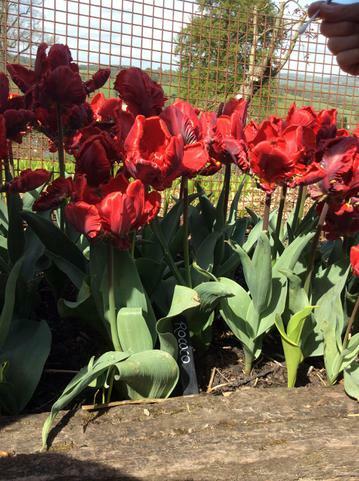 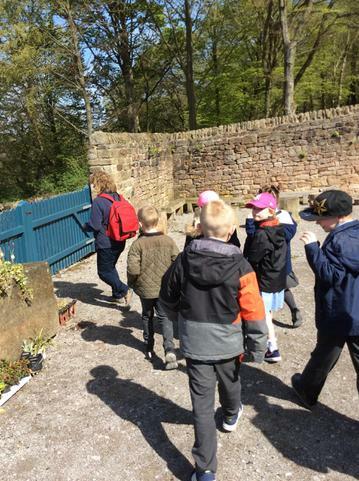 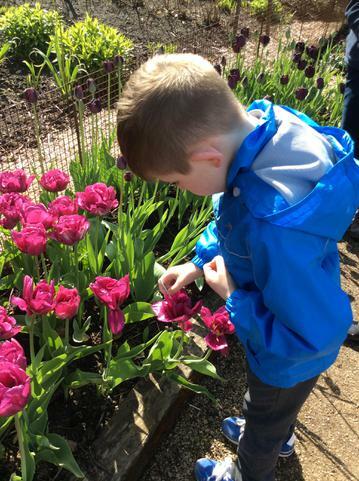 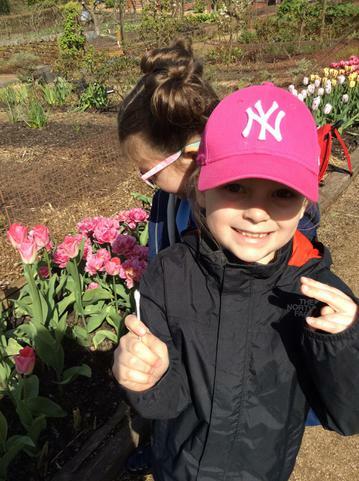 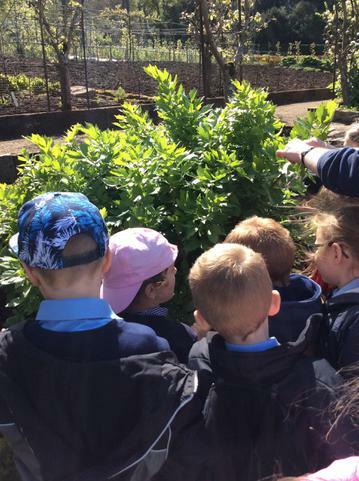 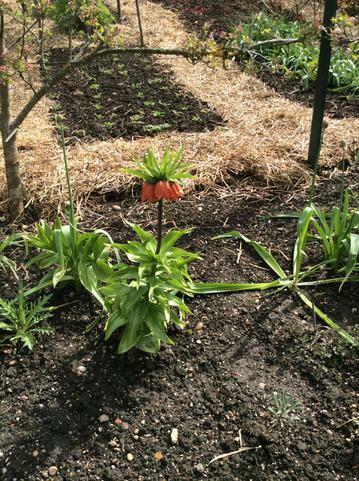 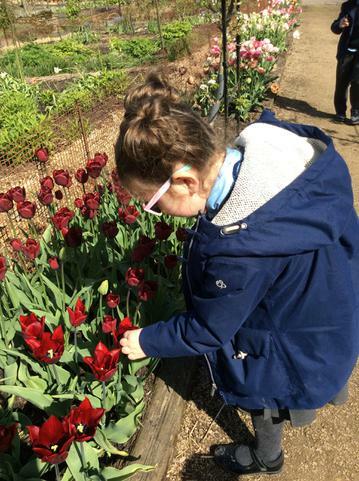 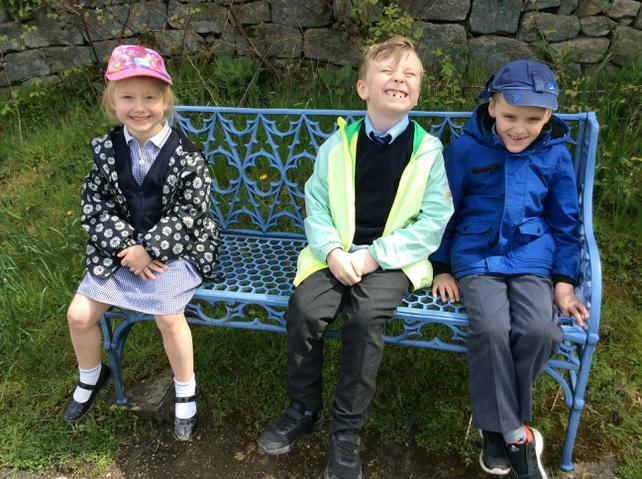 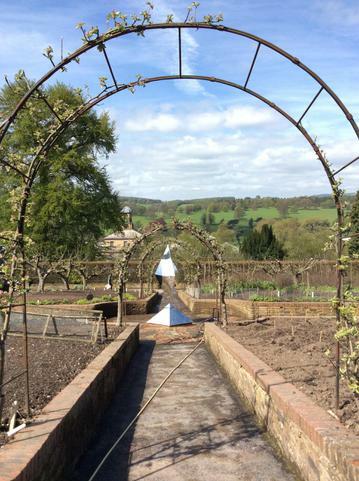 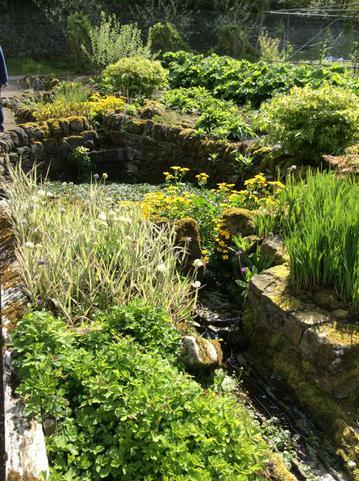 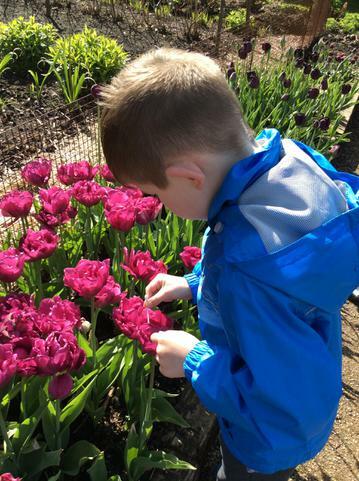 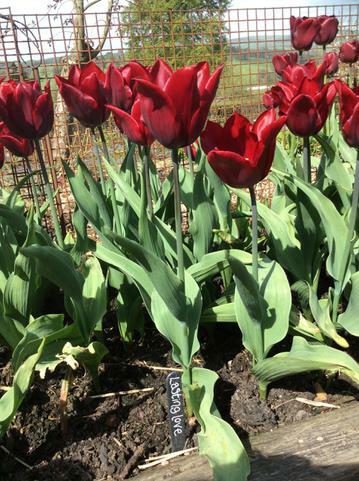 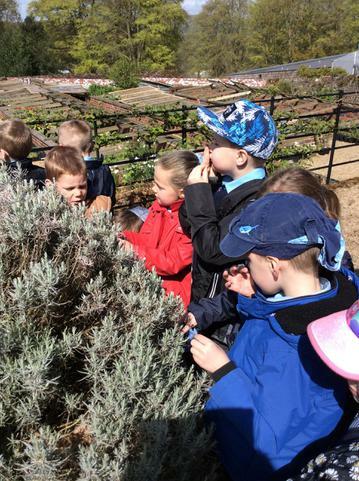 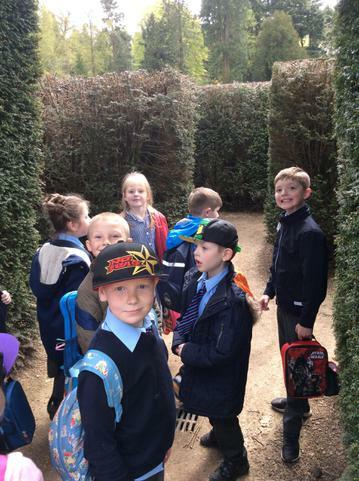 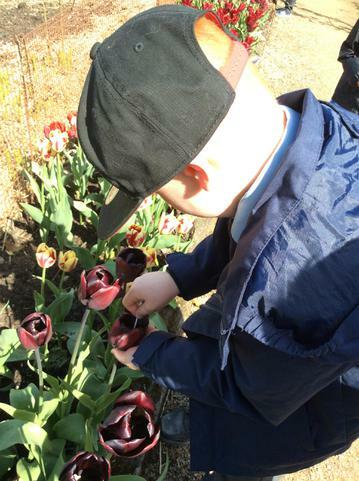 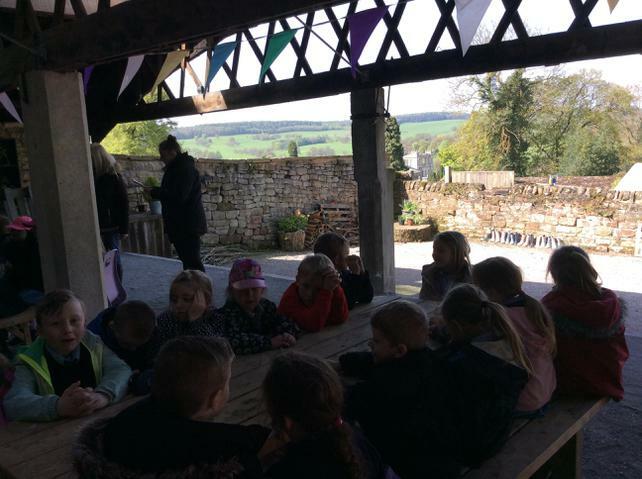 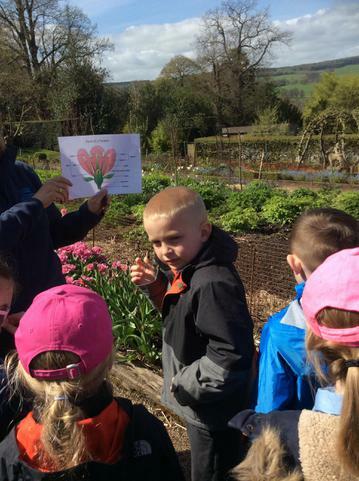 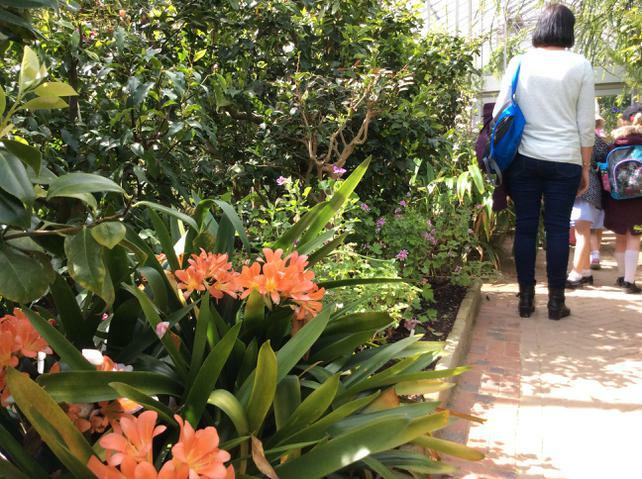 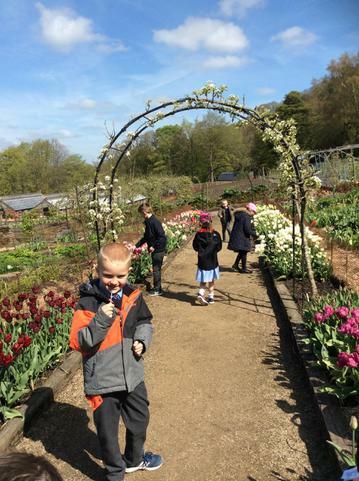 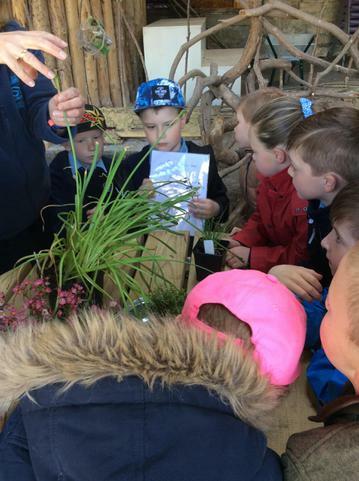 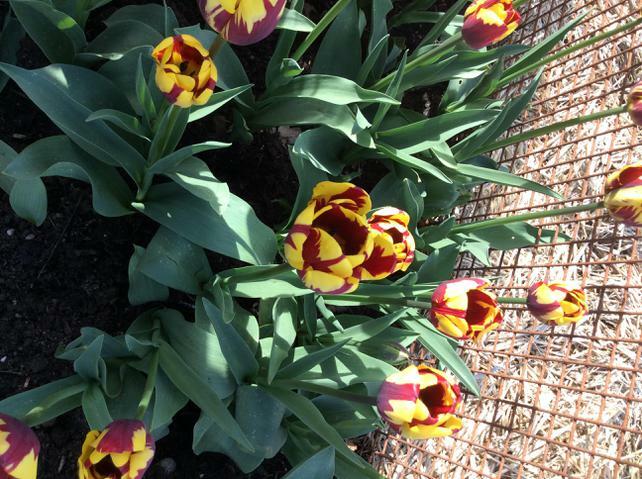 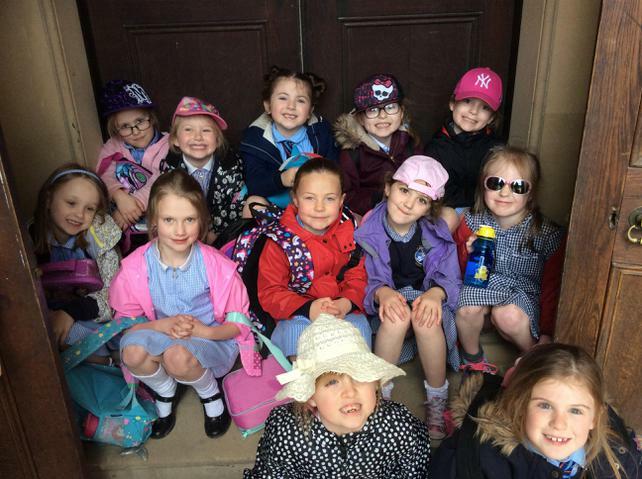 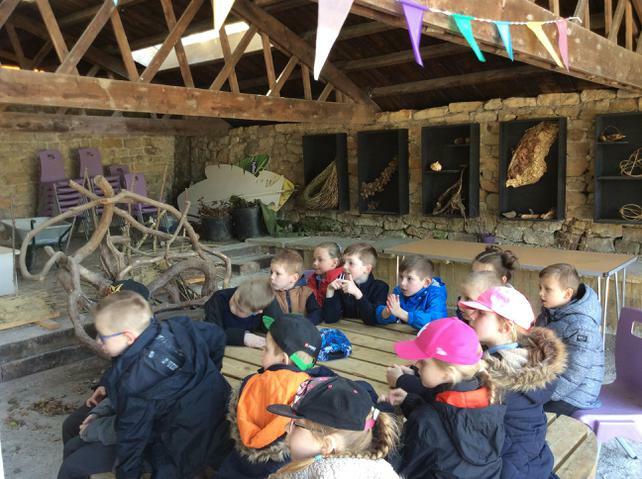 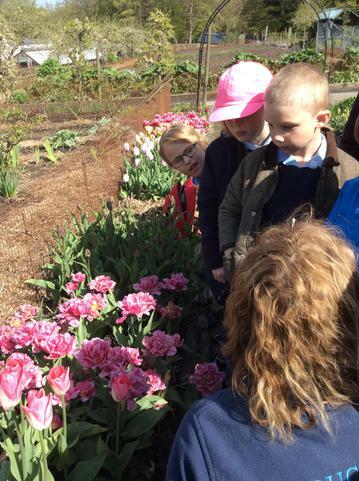 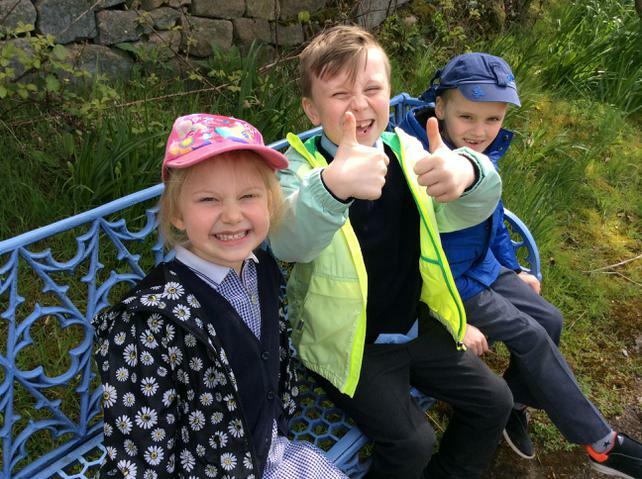 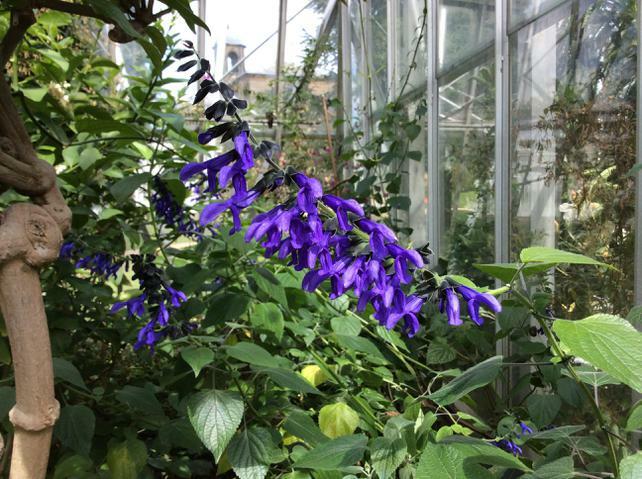 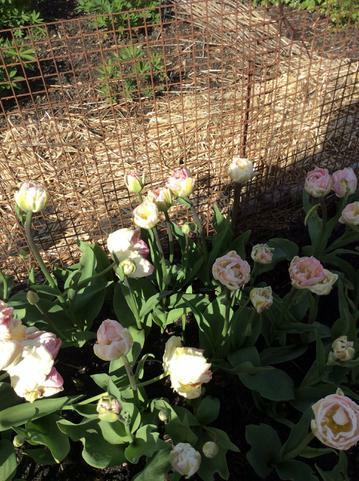 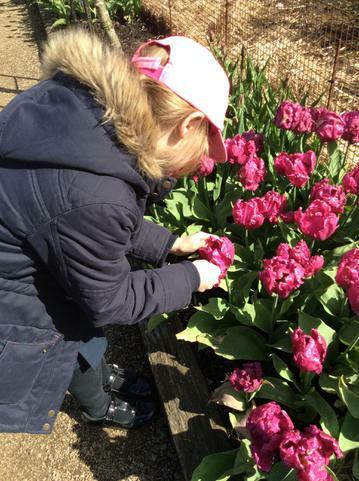 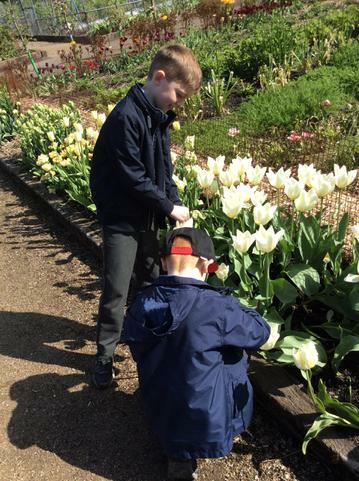 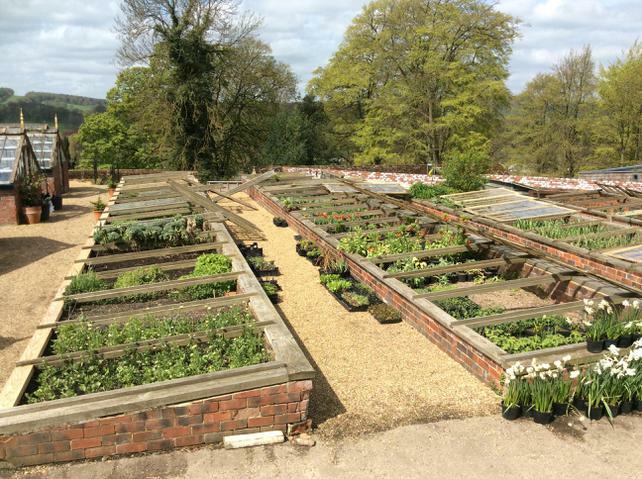 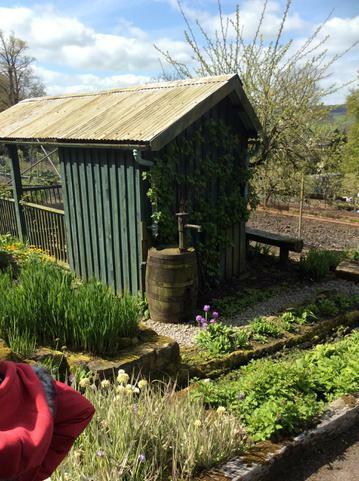 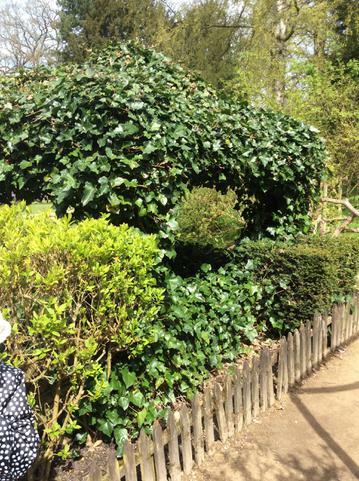 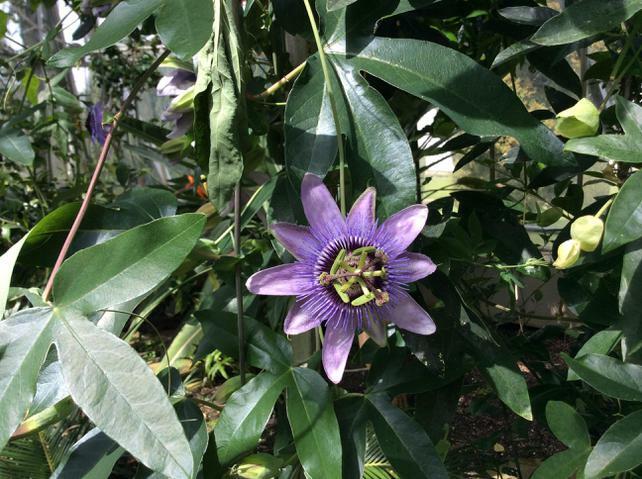 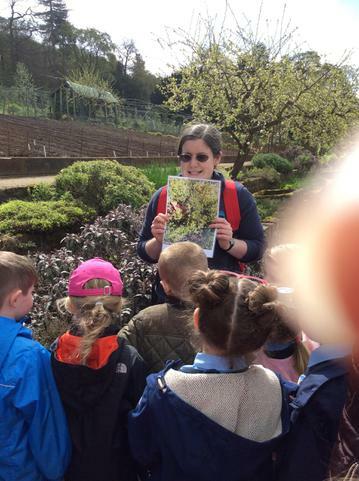 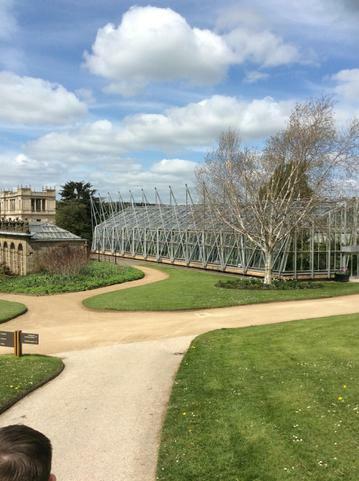 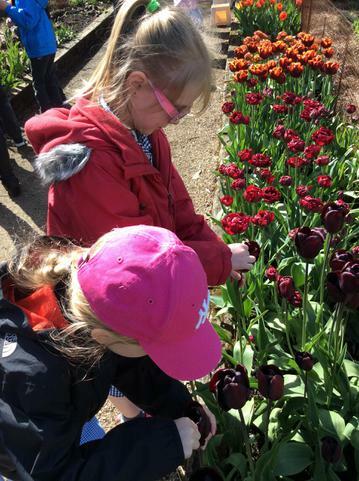 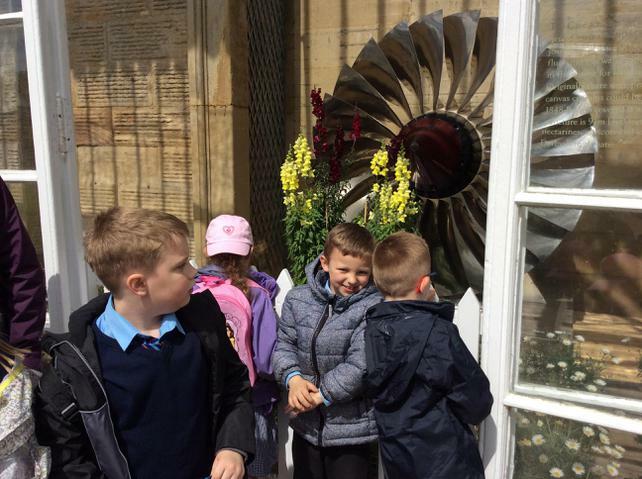 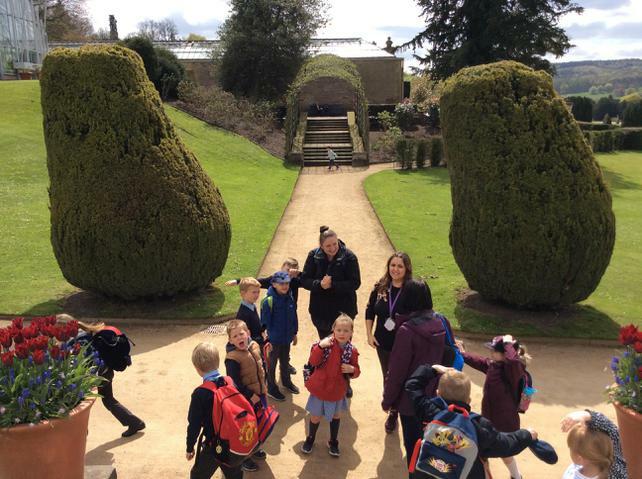 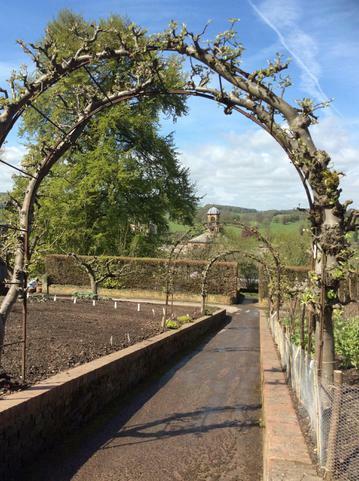 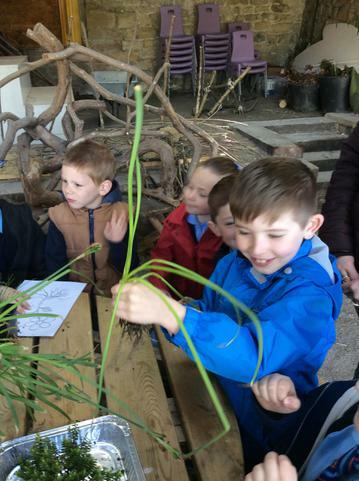 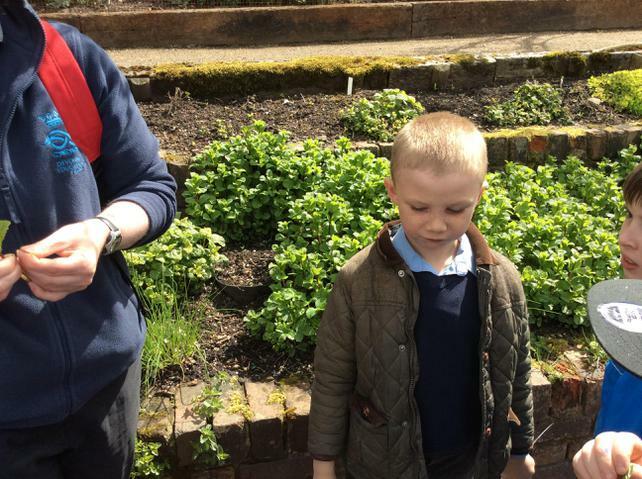 The children got the opportunity to visit different greenhouses, a scented garden, the maze and around other exciting sites in Chatsworth grounds. 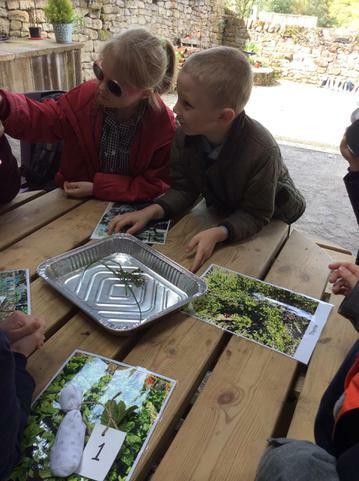 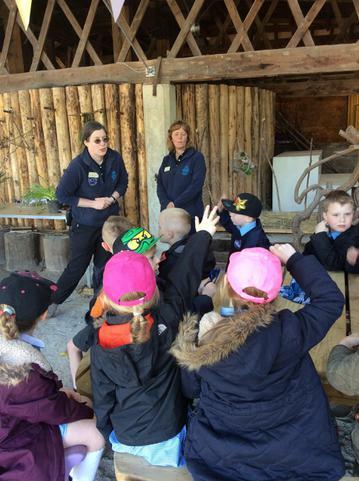 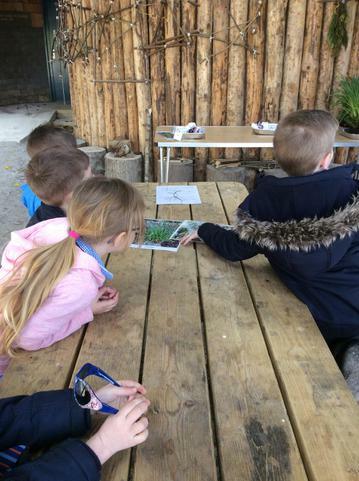 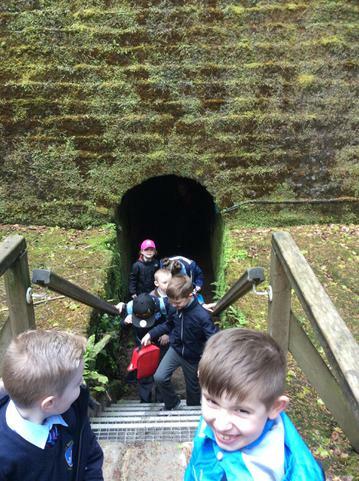 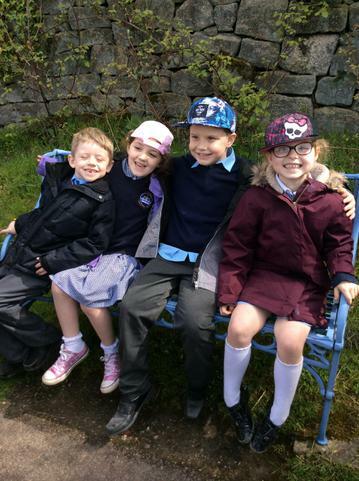 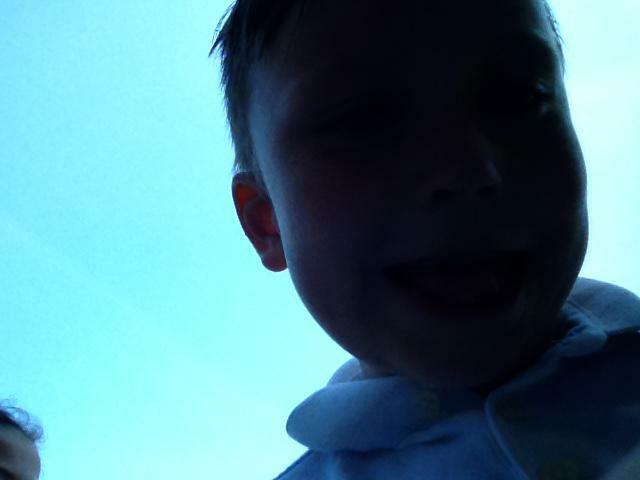 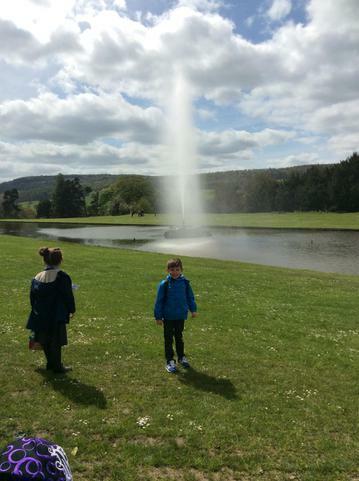 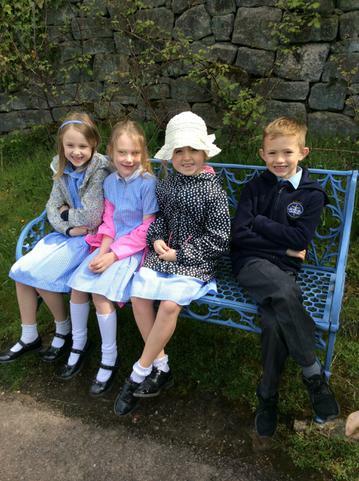 What a wonderful day we had and what excellent knowledge the children gained on our trip! 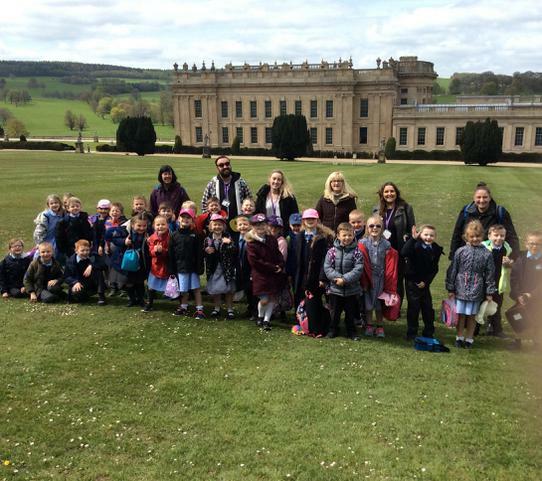 Well done Class 2 and thank you for a memorable school trip. 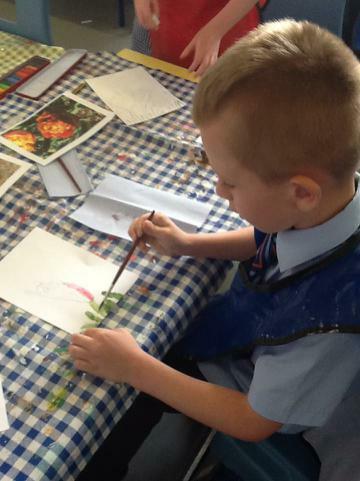 In our Holidays and Holy days Come and See work, we have looked at Pentecost day, this week. 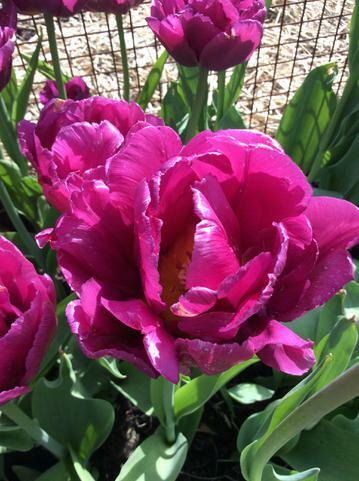 Jesus' friends knew that he would keep his promise and, with the help of the Holy Spirit, they shared the happiness of Jesus' love with everyone. 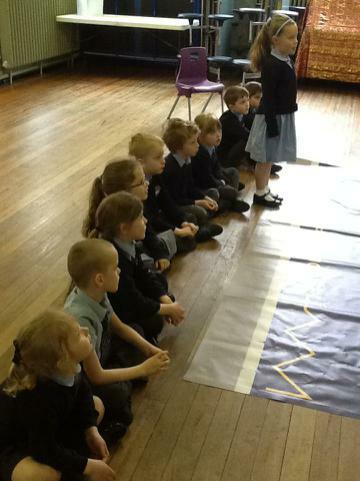 Class 2 spoke about our favourite part of the Pentecost story and the change the Holy Spirit made to the friends of Jesus. 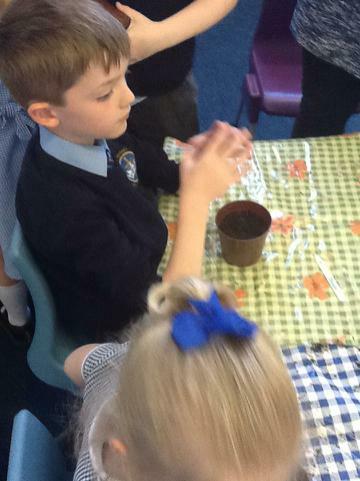 We went on to use an image from God's Story to add thought bubbles to show how the friends of Jesus and the people in the picture were thinking and feeling. 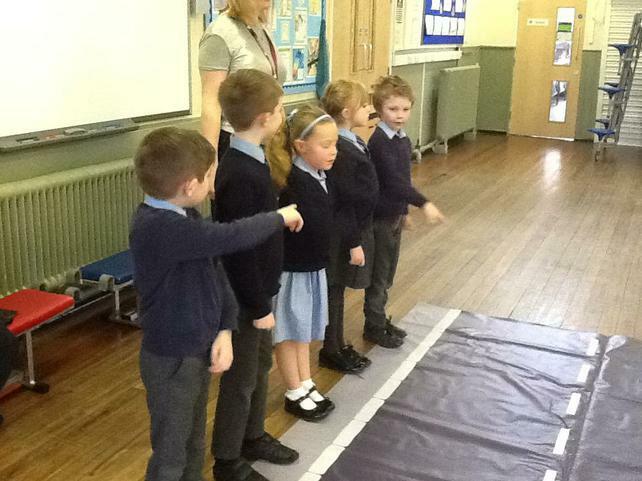 The children then composed their own dances with coloured streamers showing the sequence of events on Pentecost day and how the friends of Jesus changed. 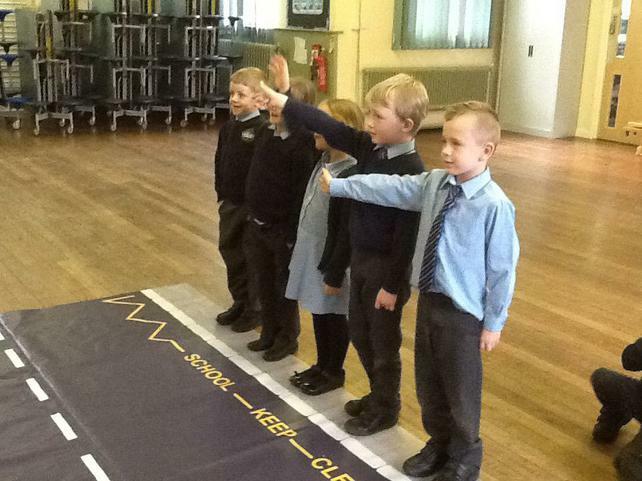 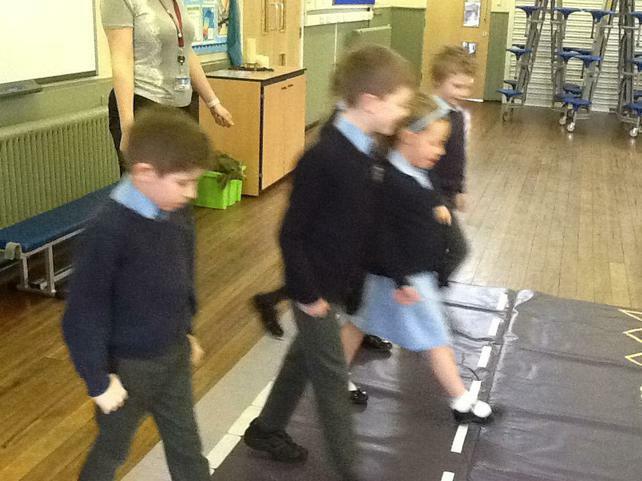 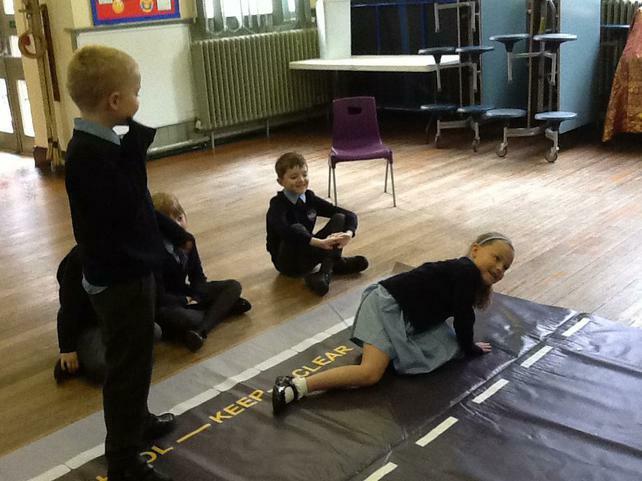 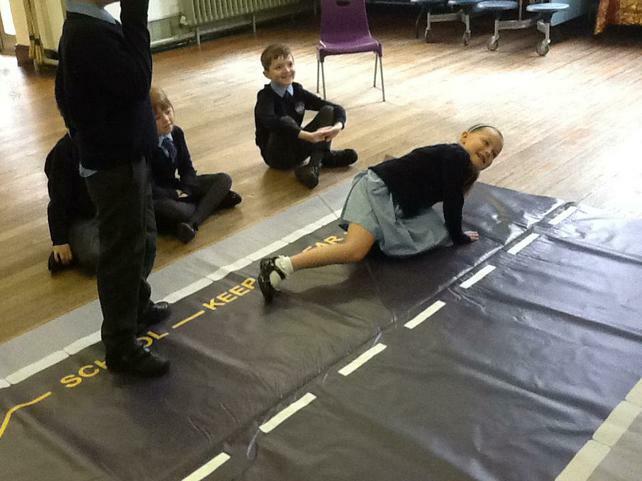 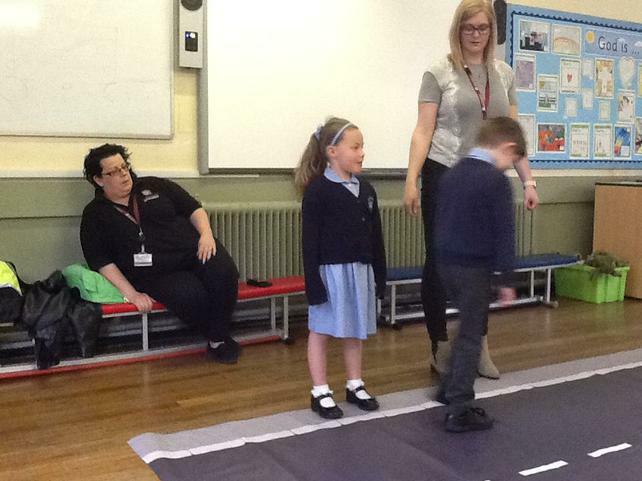 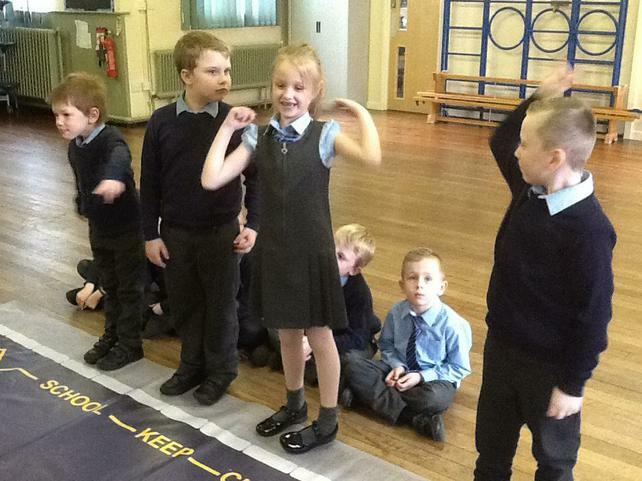 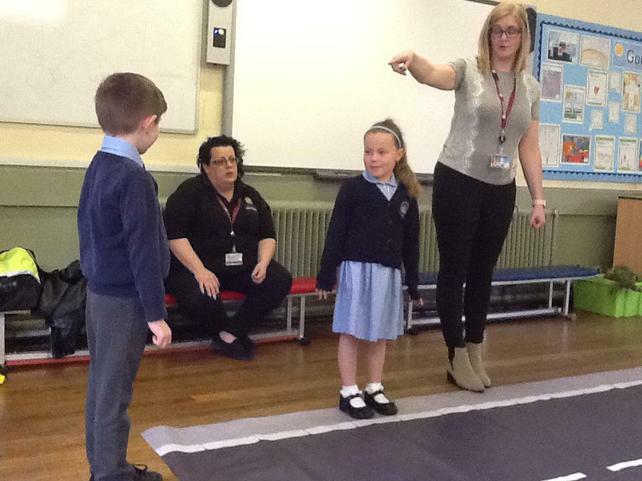 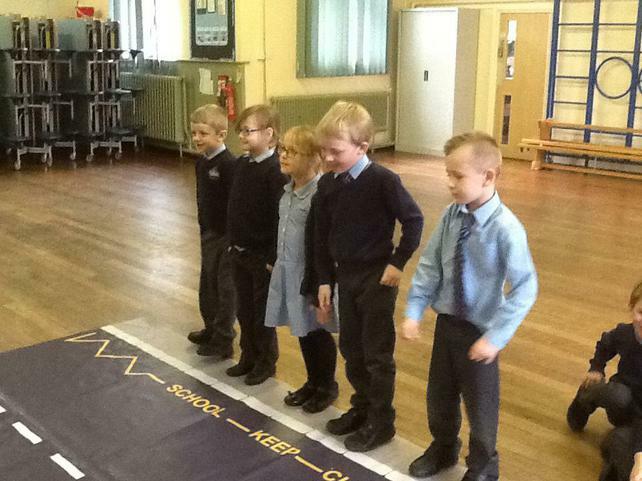 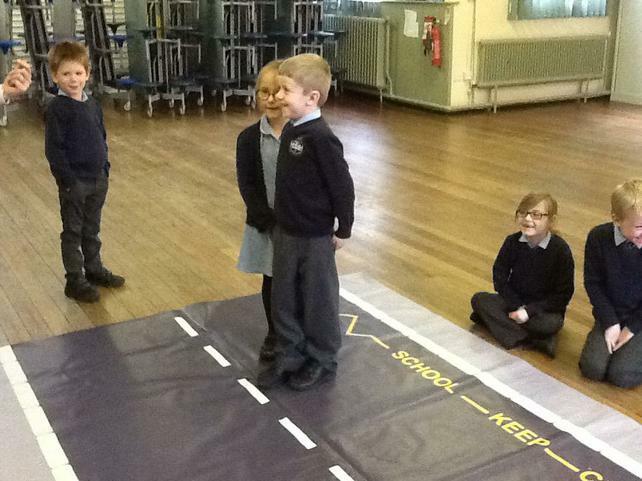 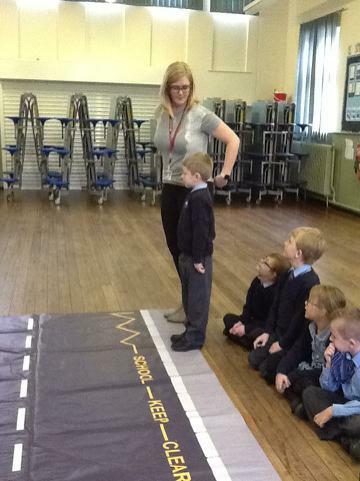 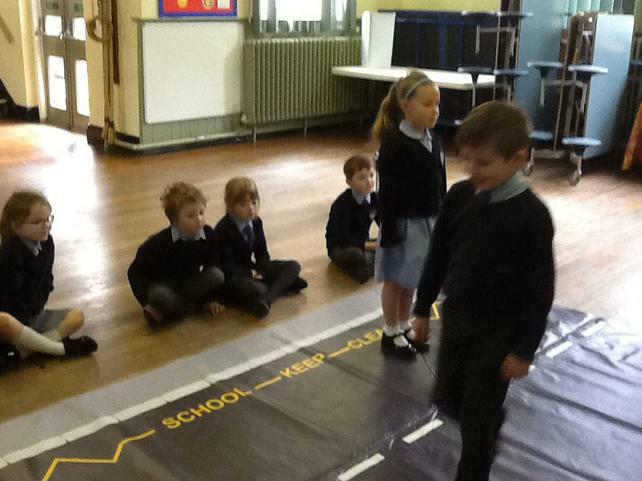 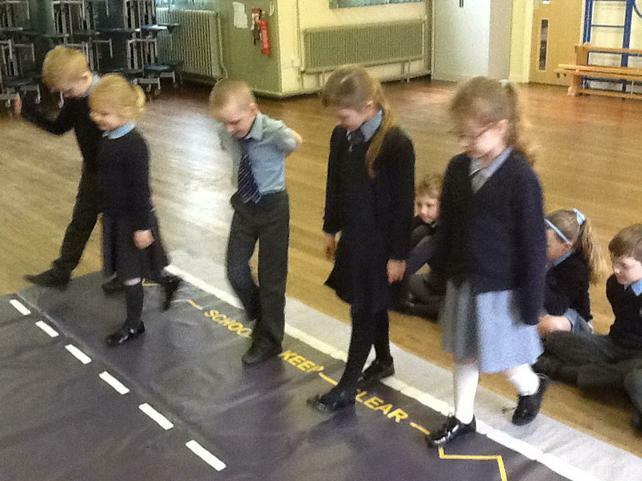 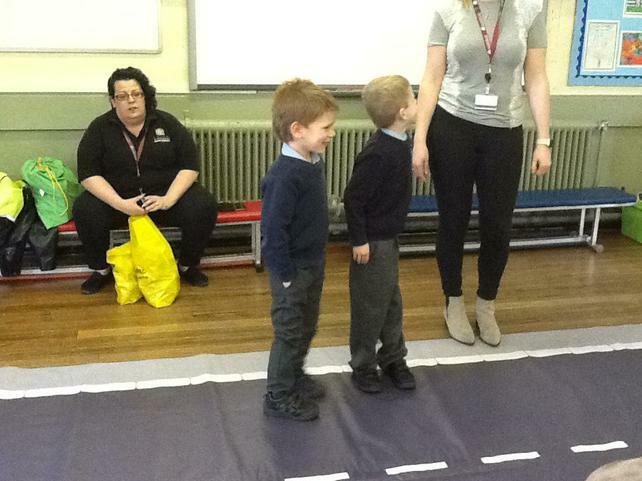 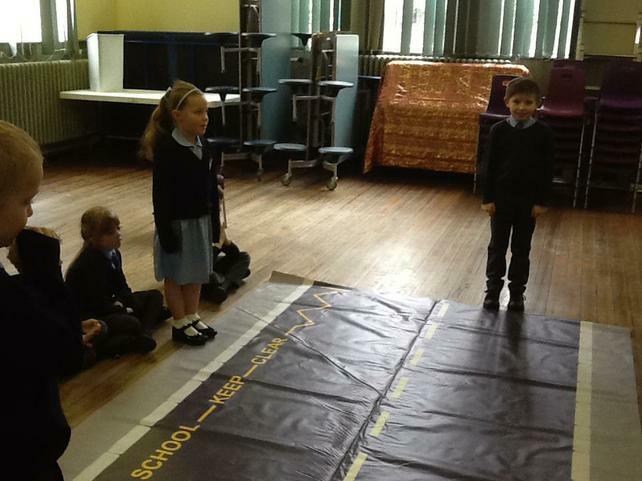 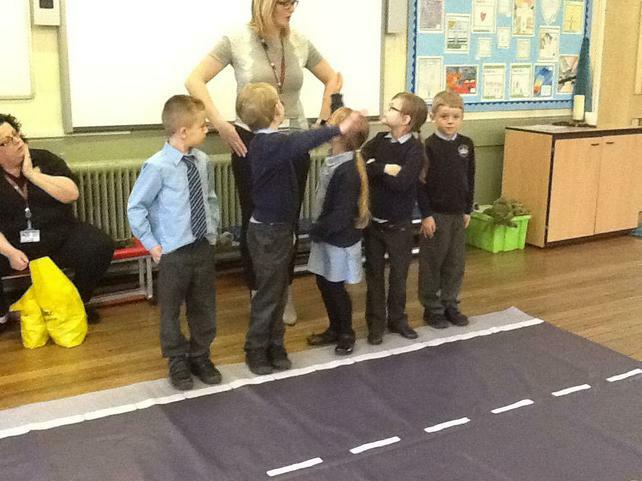 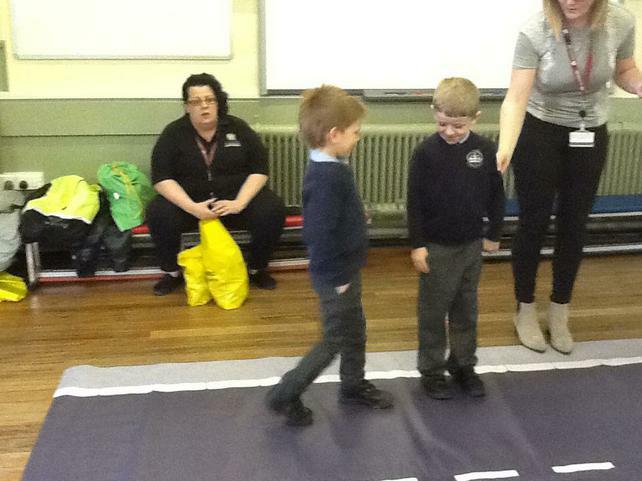 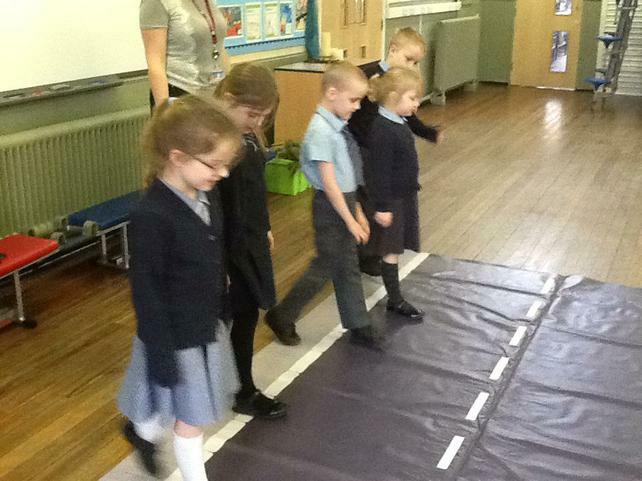 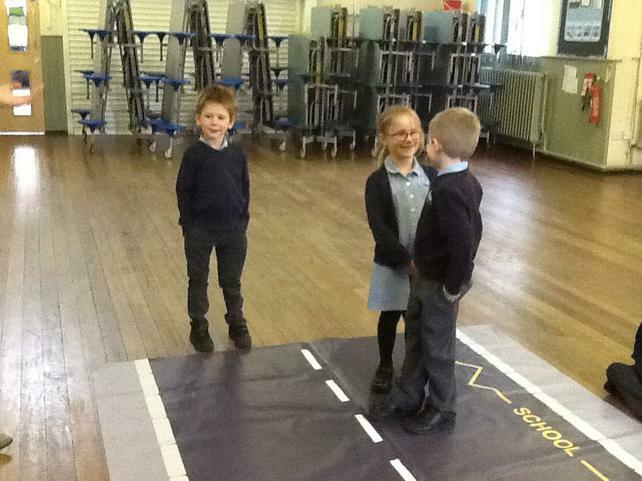 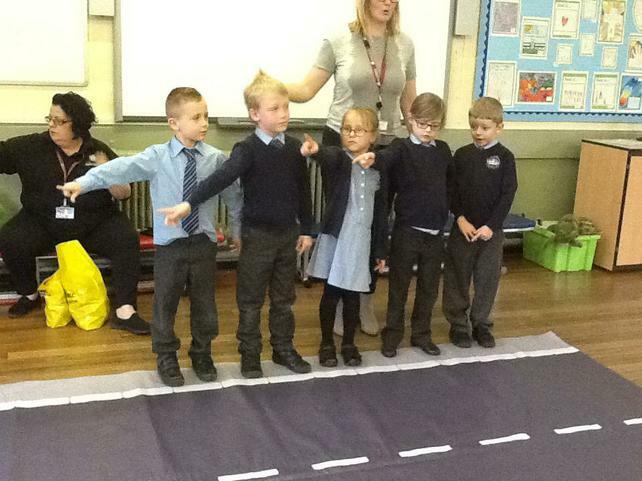 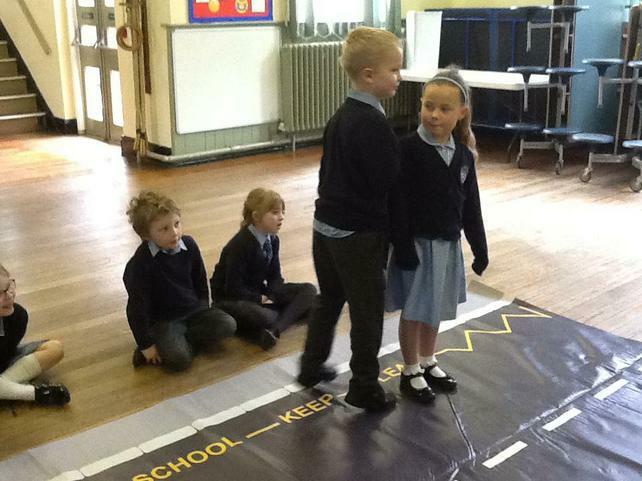 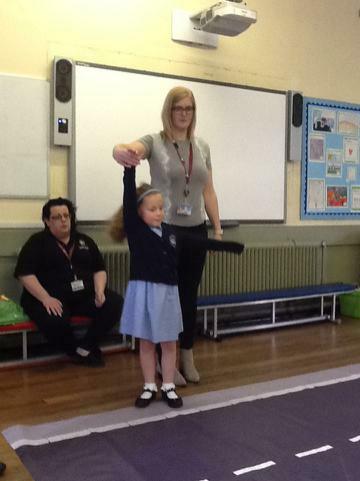 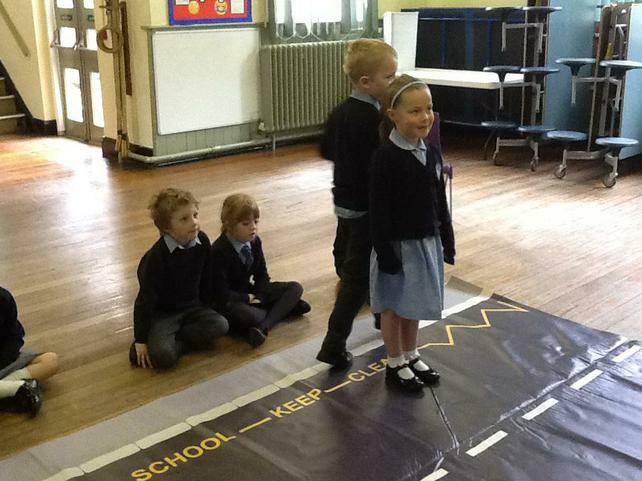 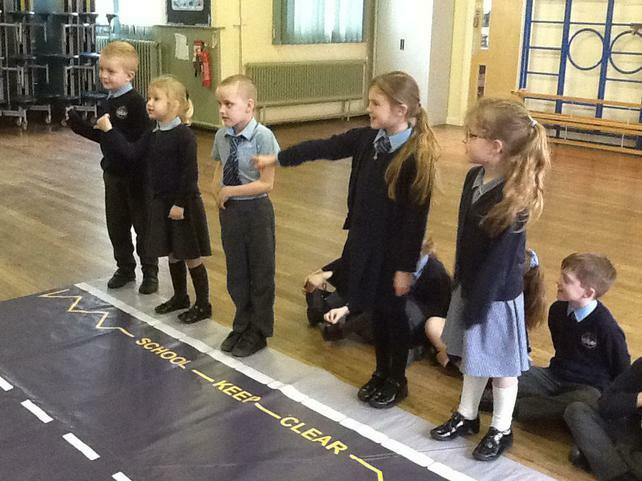 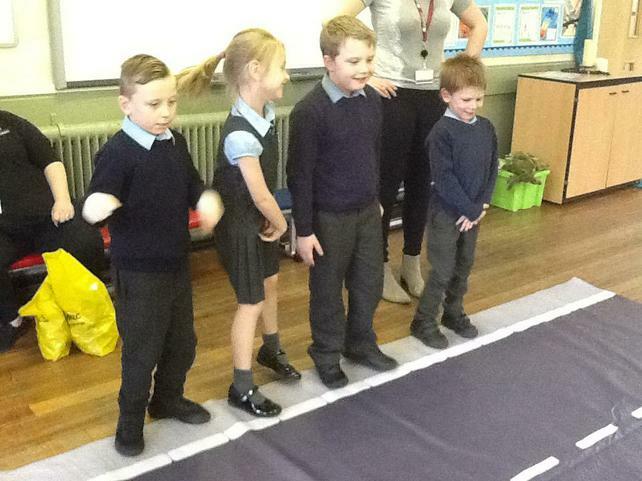 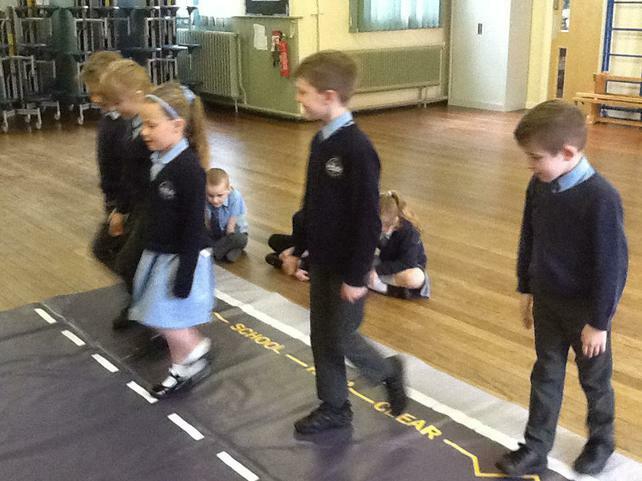 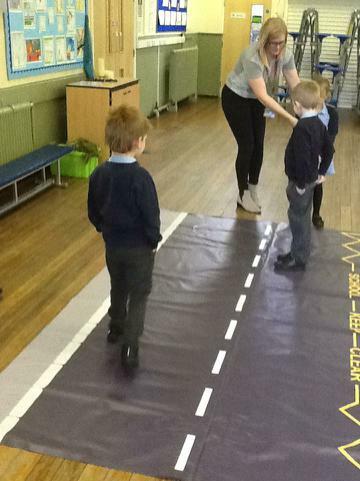 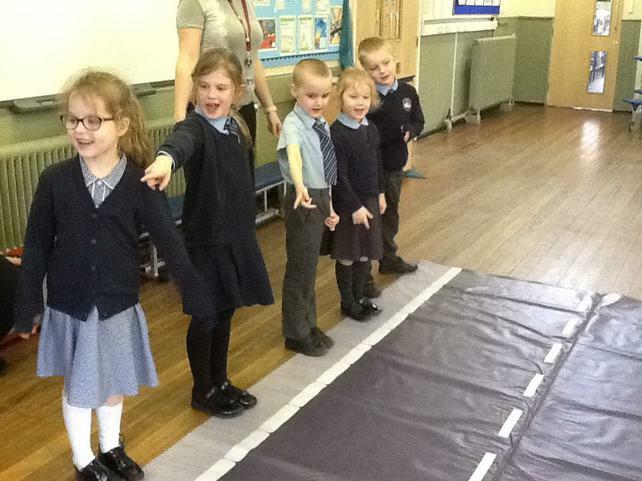 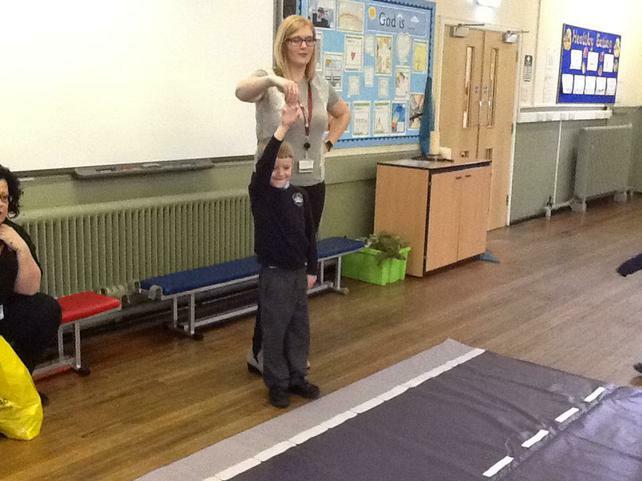 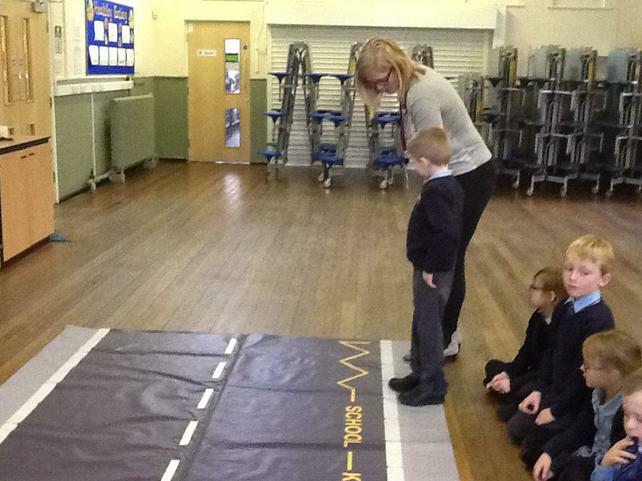 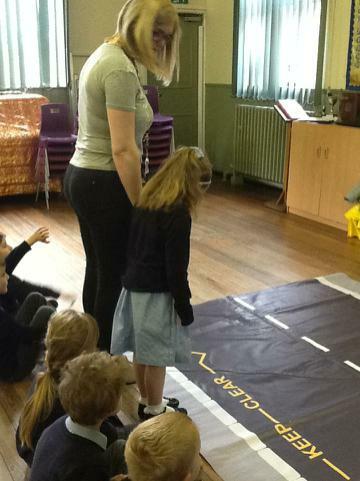 This week was Road Safety Week and Class 2 got the opportunity to be involved in an activity called Street Fleet. 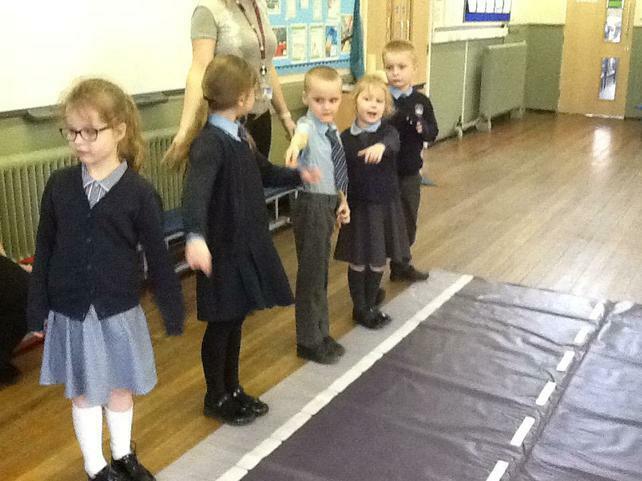 We learnt how important it is to look right, left and then right again! 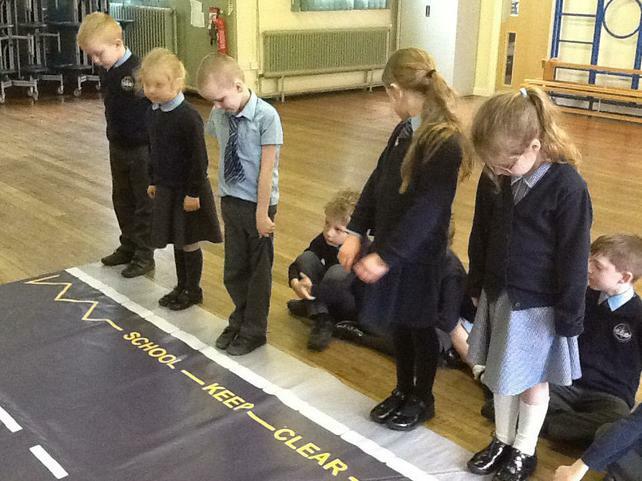 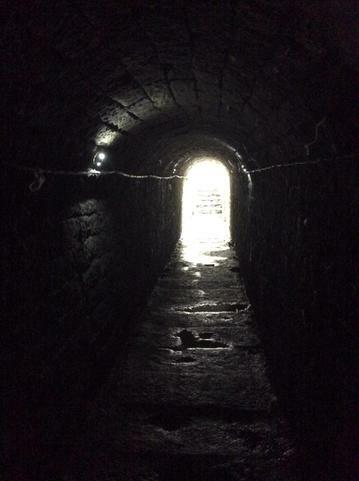 The children also learnt to think, stop, look and listen! 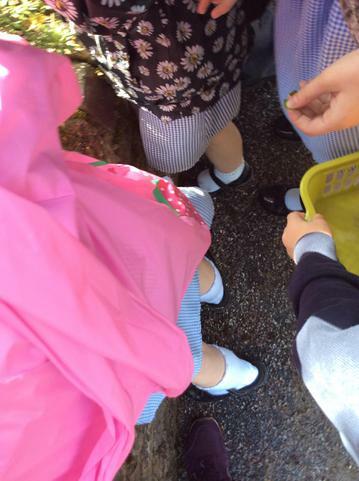 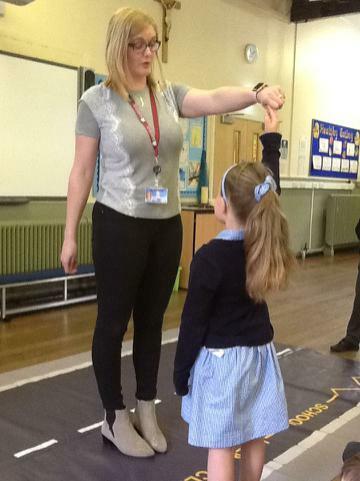 We also learnt how important it is to stand fully on the pavement and to hold hands when crossing the road with an adult we know. 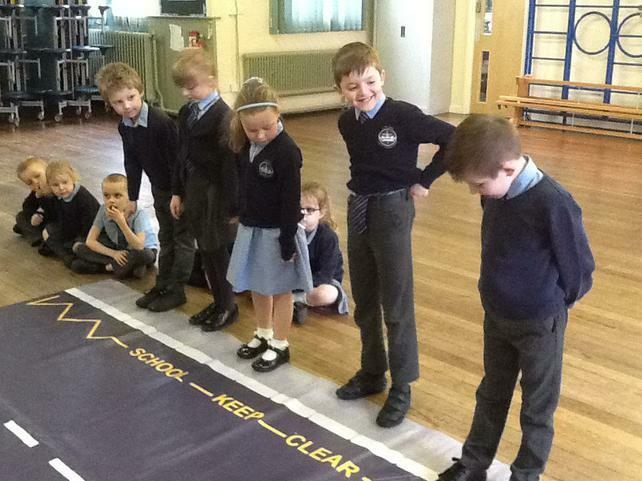 Well done Class 2 for your fantastic participation in Street Fleet and for all the new knowledge you have gained on how to stay safe by the road! 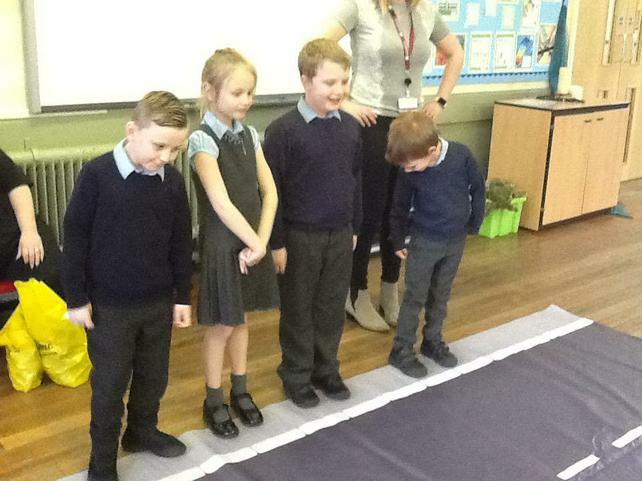 In one of our Guided Reading sessions this week, 5 children in our class read the play 'There was an old lady who swallowed a fly' and we answered comprehension and inference questions as a class. 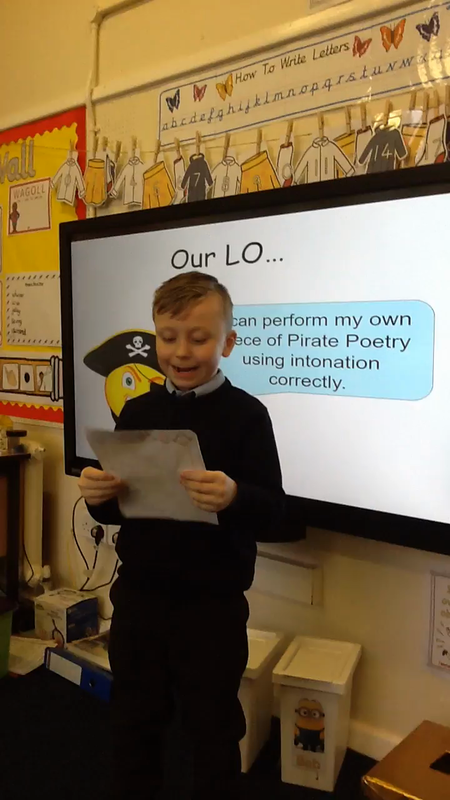 Well done to all of our fantastic readers and to everyone in Class 2 for their brilliant comprehension work! 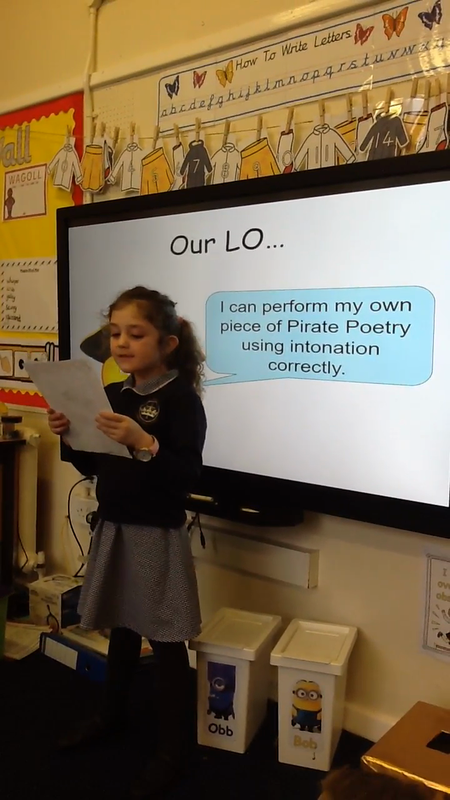 This week, we continued our 'Land Ahoy!' 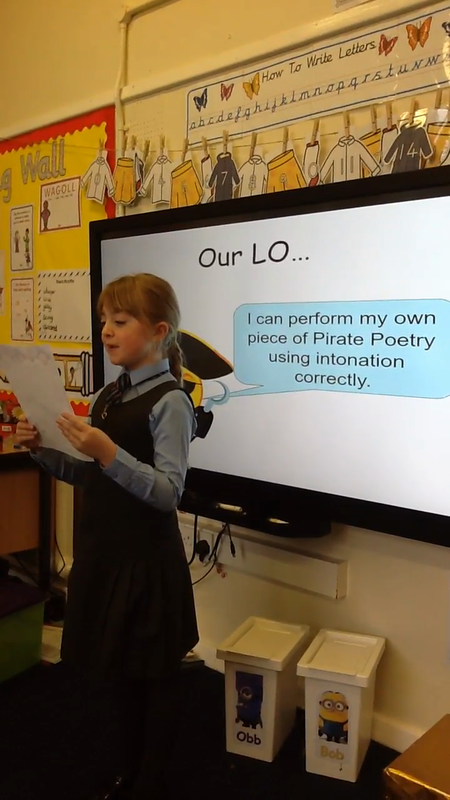 topic in Class 2, looking at Pirate Poetry and Rhymes. 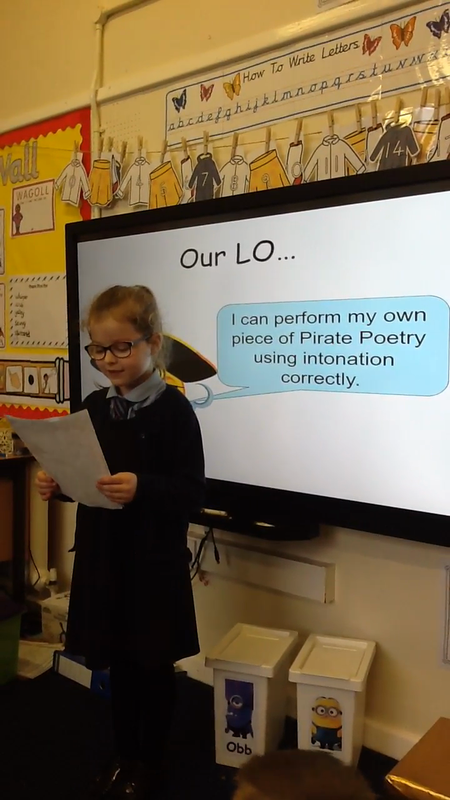 We began our week by learning the Pirate Rhyme 'When I Was One...'and then we noticed the features included in this rhyme. 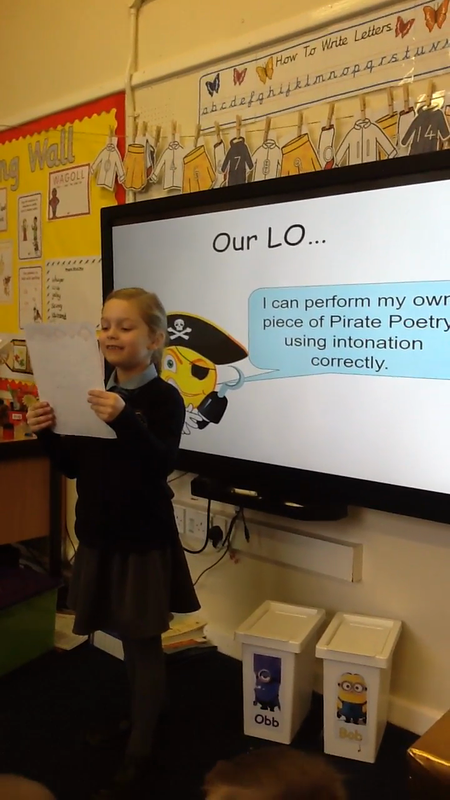 We went on to make our own pirate rhymes, taking inspiration from our song of the week. 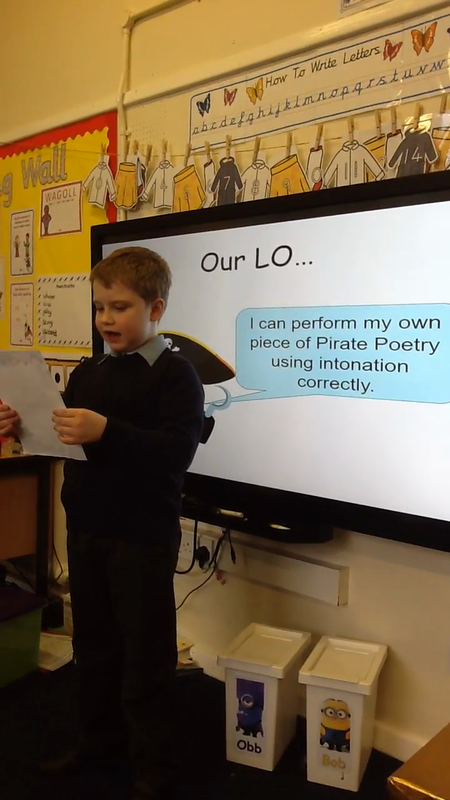 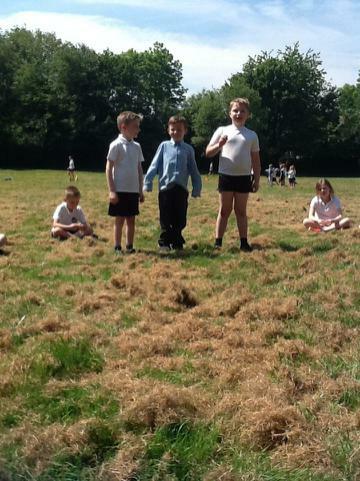 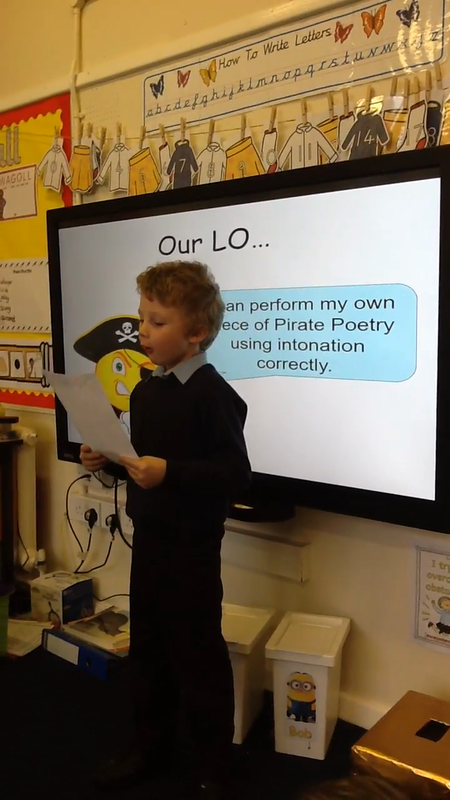 The children then went on to perform their own Pirate Poetry to Class 2 and they did a fantastic job!